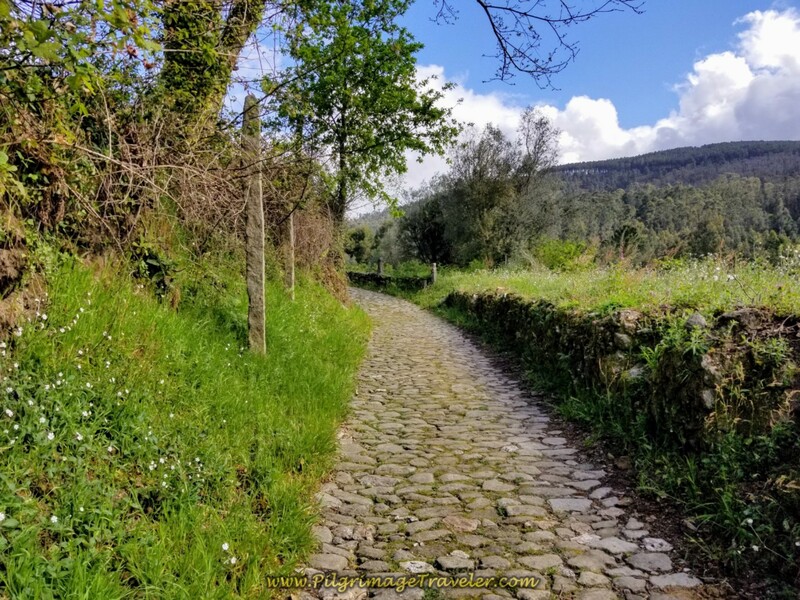 Day eighteen on the Central Route of the Camino Portugués is mostly off-pavement on paths and cobblestone lanes and includes a rigorous climb in the middle of the day on the ancient Roman road, the Via Romana. It may take some digging deep, but if you go slowly and savor the experience it is no trouble at all! 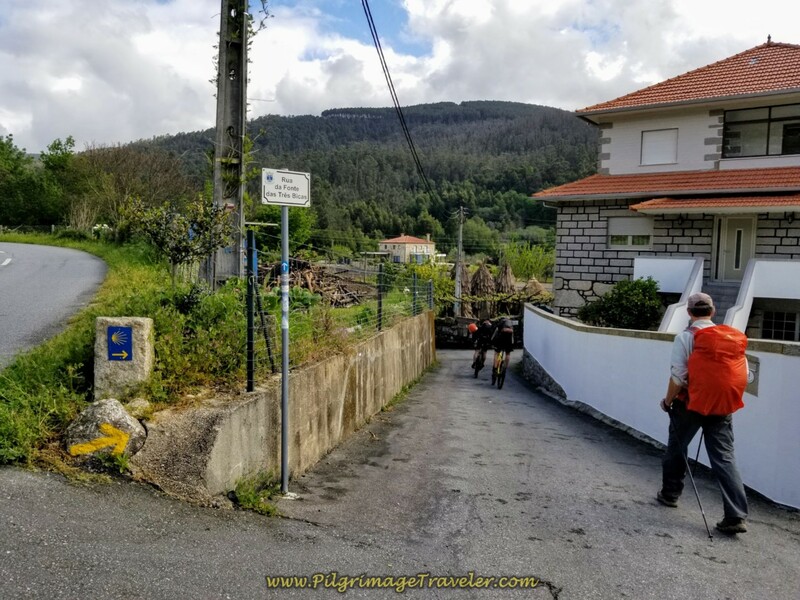 Due to the rigors of the walk on this day, Magdalena, our wheelchair bound friend, decided to opt out entirely and take the bus to Rubiães. It was a wise choice. There is absolutely no way, short of carrying her and her chair that she could have done it with us, as you will see below. Here is our map that I created from our GPS tracks, with accommodations, cafés and nearby supermarkets. As you can see there are fewer services on this very rural day, so plan accordingly and carry food in your pack. When you look at the elevation profile below, there is a significant elevation change of 668 meters, over 200o feet. 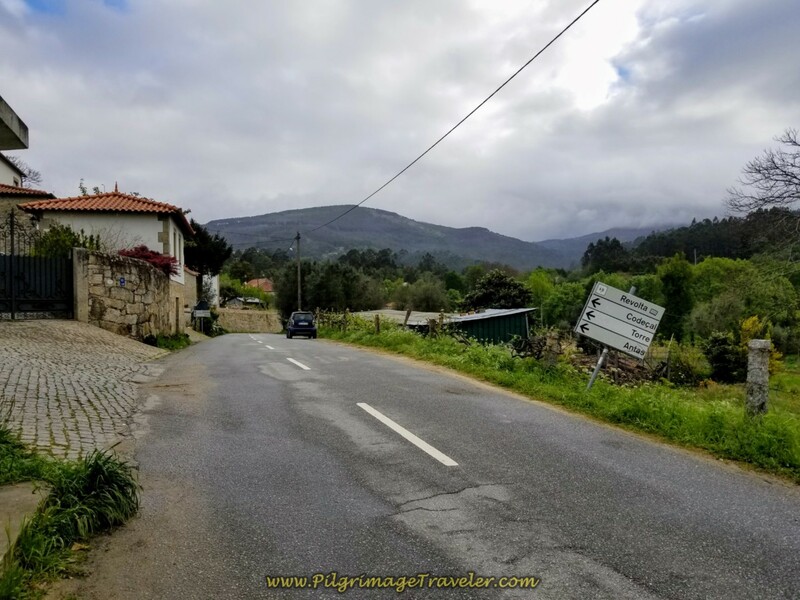 As my friend Glyvia, from Spain says, after Ponte de Lima, it is up, up up! And she is right. However, if you understand yourself and your capabilities and take it at your own pace, you will be just fine. 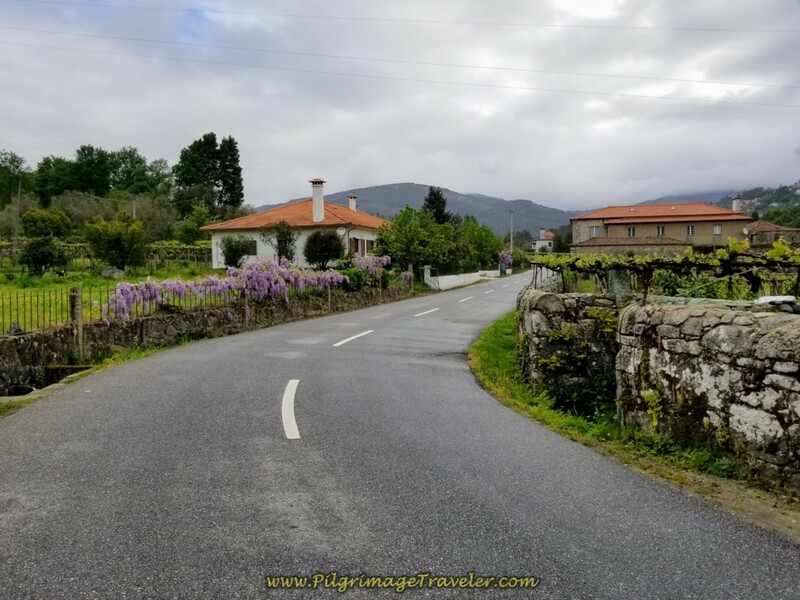 The walk is so lovely and off-pavement, that you may not even notice the climb until just before the top, the Alto da Portela Grande de Labruja, on the ancient and rocky Roman road. 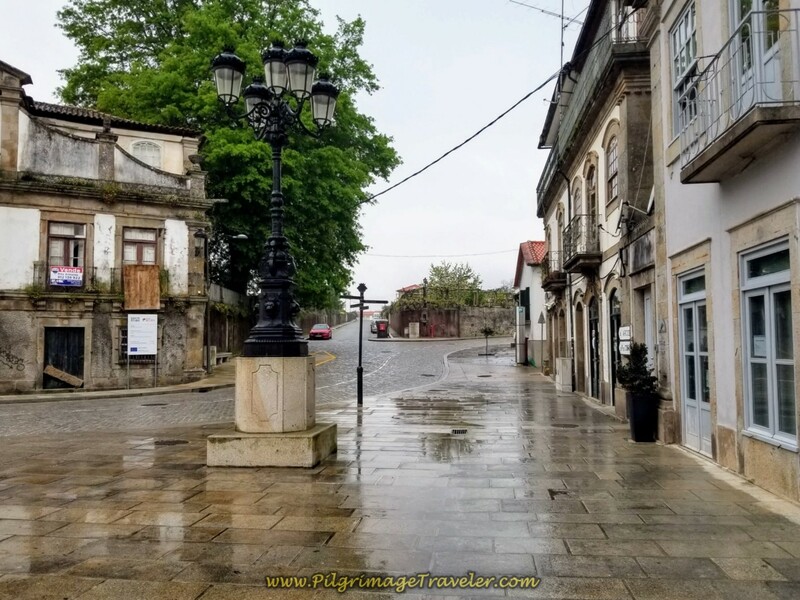 We woke up to a drizzle, when we looked outside our window of the Casa da Vila in Ponte de Lima. The streets were glistening with moisture, so we geared up for a rainy day. 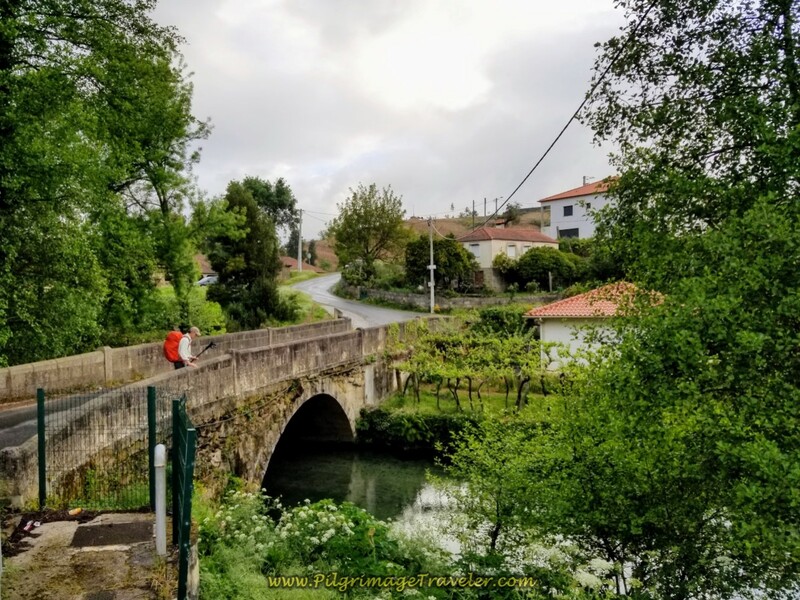 Here is Rich, where we started our day, heading north on the medieval 14th century bridge in Ponte de Lima, with the church, the Igreja de Santo António da Torre Velha in the background. 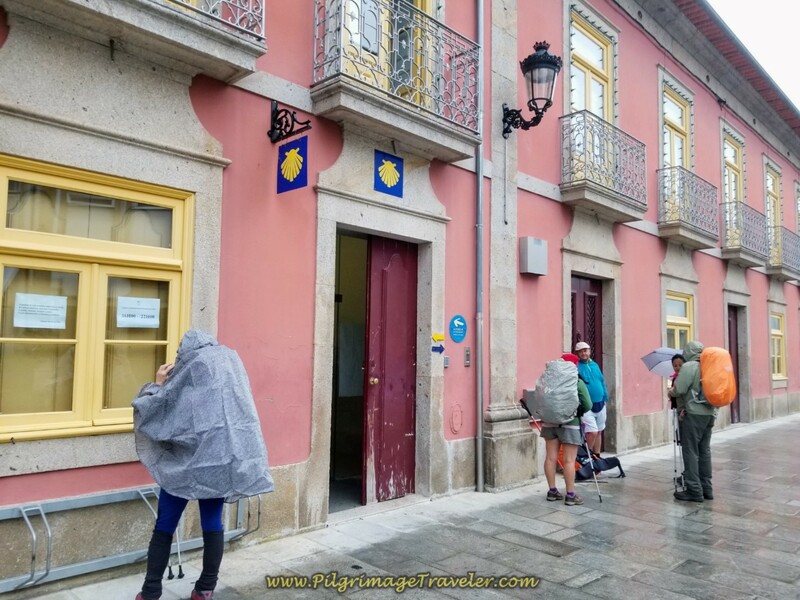 After crossing the bridge, we walked by the Albergue de Peregrinos de Ponte de Lima, with lots of pilgrims milling about in the drizzle, waiting to get going. 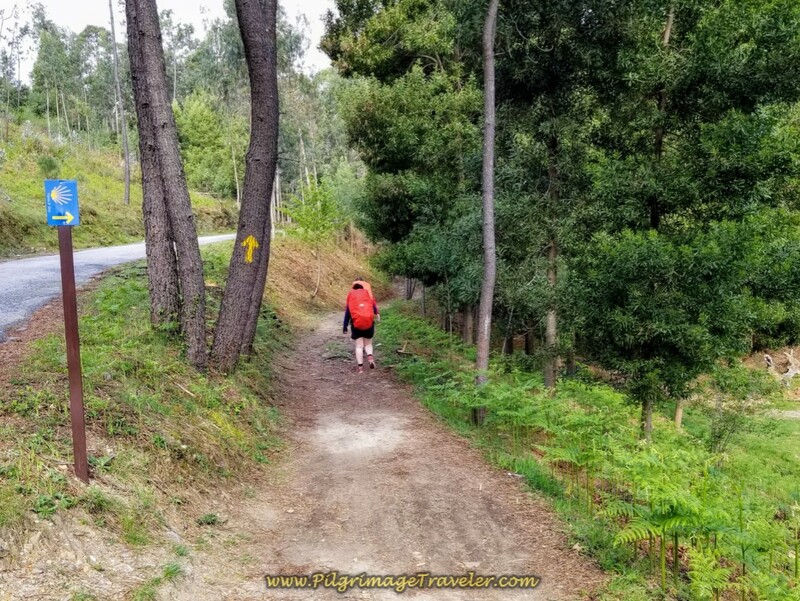 Our friends were all staying here, but we had agreed the evening prior, as we exchanged contact information, that we would meet up again, either on the trail or in the next town. 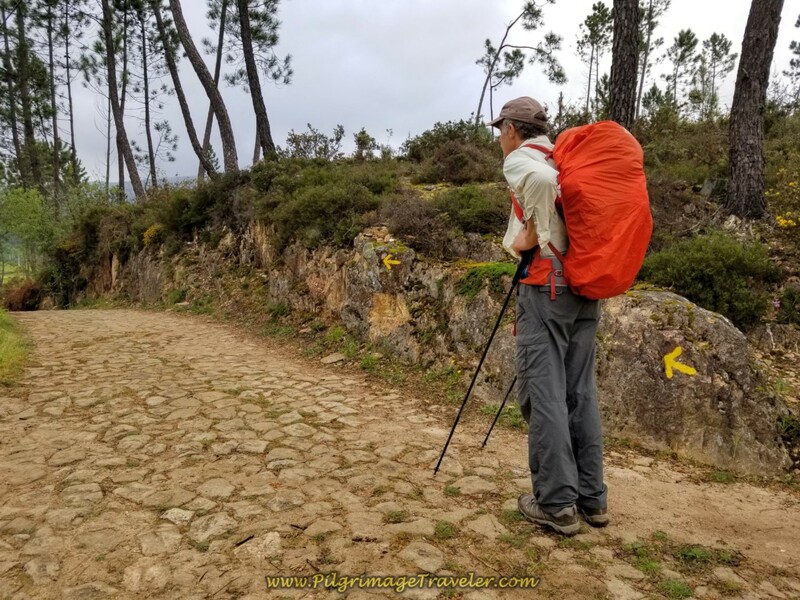 After the albergue, you walk on the pedestrian way, and take the first hard right, walking by a park on your right side. You come to a T-intersection in a few hundred meters and take another right, continuing to follow the park. Turn left in another hundred meters, at another T. In another one hundred meters or so, take a left off the road to join a path system through the countryside. 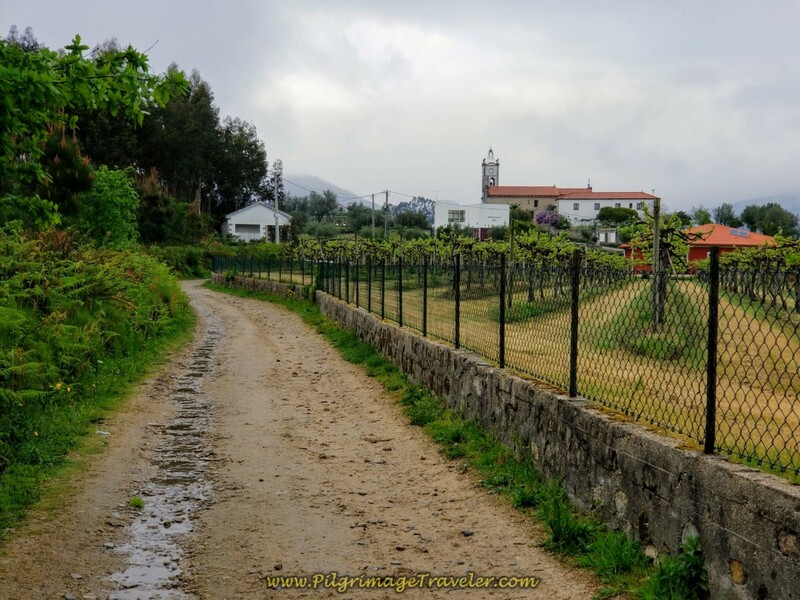 If you stay on the road, you will come to the Quinta do Arquinho. 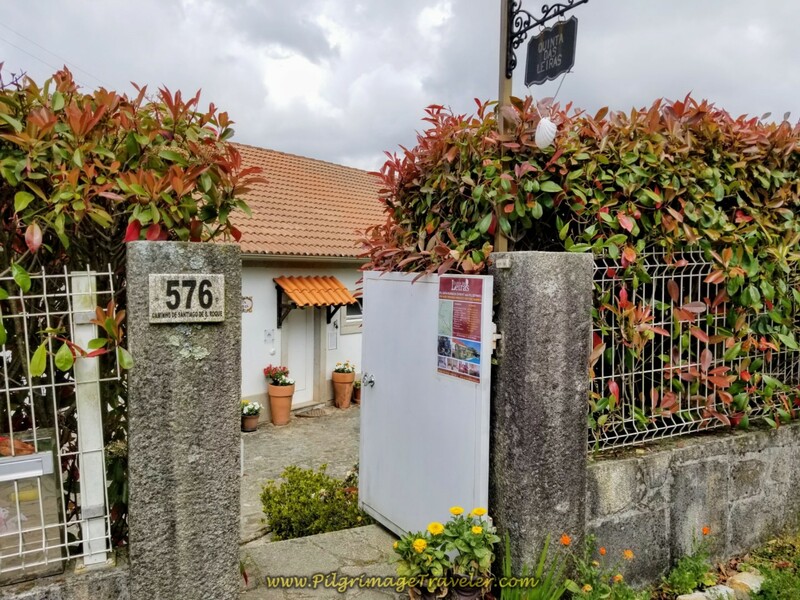 Refer to our map, above, or click on the link if you are interested in staying here instead of in Ponte de Lima. 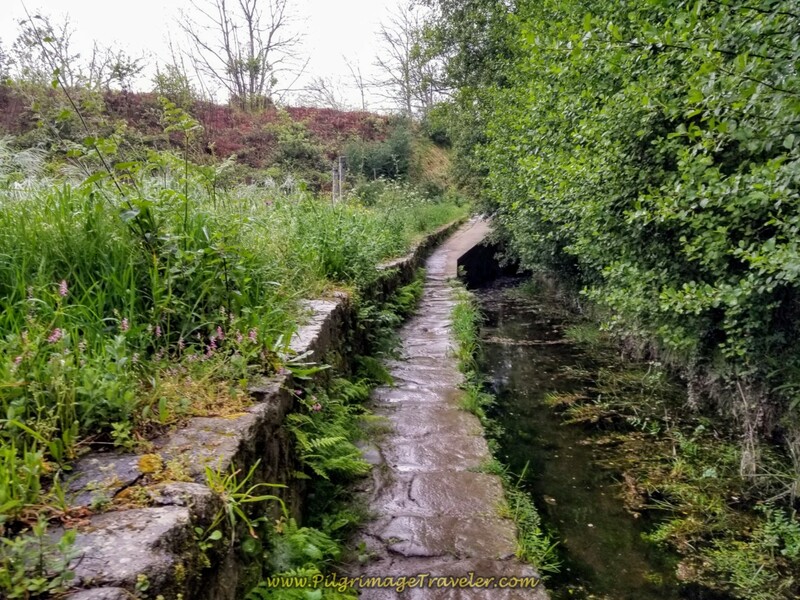 The path eventually becomes a stone and concrete one as it follows a canal system on day eighteen, Central Route of the Portuguese Camino. ...and turns to cobblestone as it crosses the N202 and continues onward. The drizzle soon ceased, but the road, now dirt, was still quite muddy, as we walked under the A27. 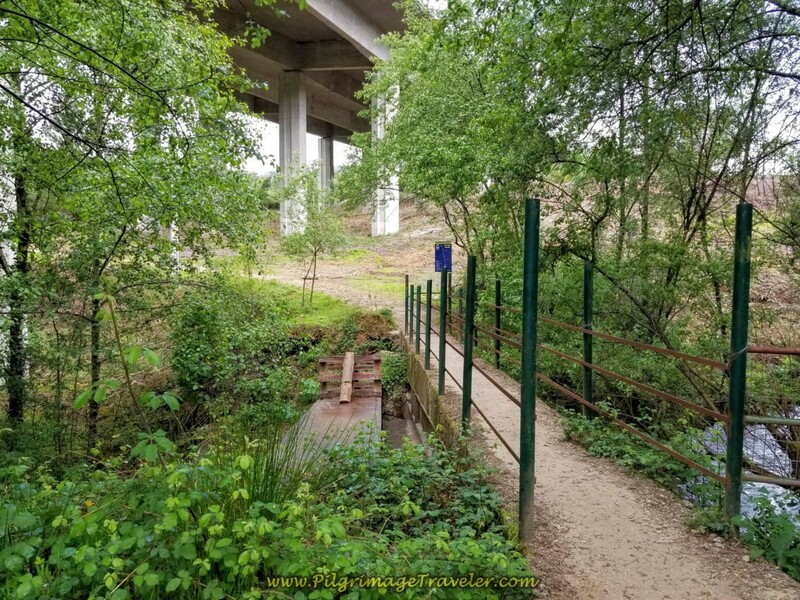 It was under the overpass that we finally stopped and took off our rain gear, as it was quite muggy with it still on. The mistiness remained for awhile yet. 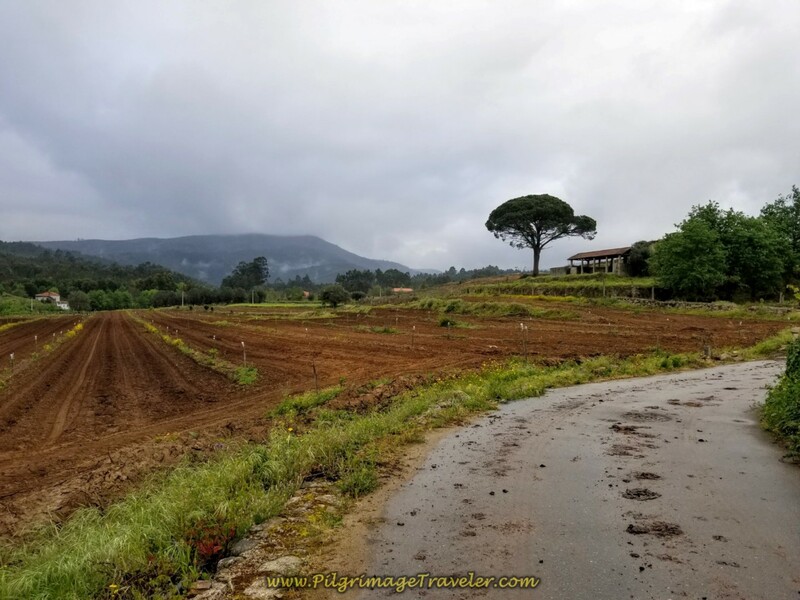 The muddy, dirt road meets the paved road ahead as you enter the town of Arcozelo, shown below. You can see the church ahead. 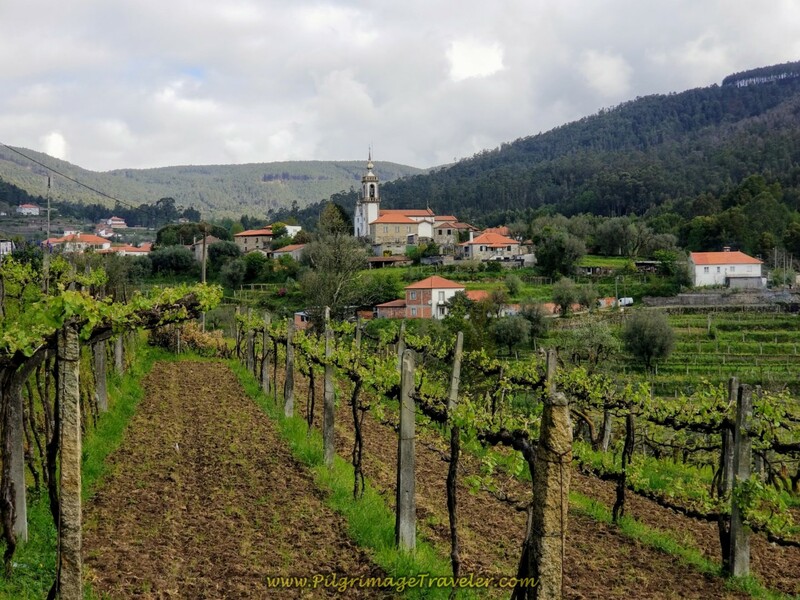 We had just walked a glorious 2.0 km off pavement to this point from Ponte de Lima. 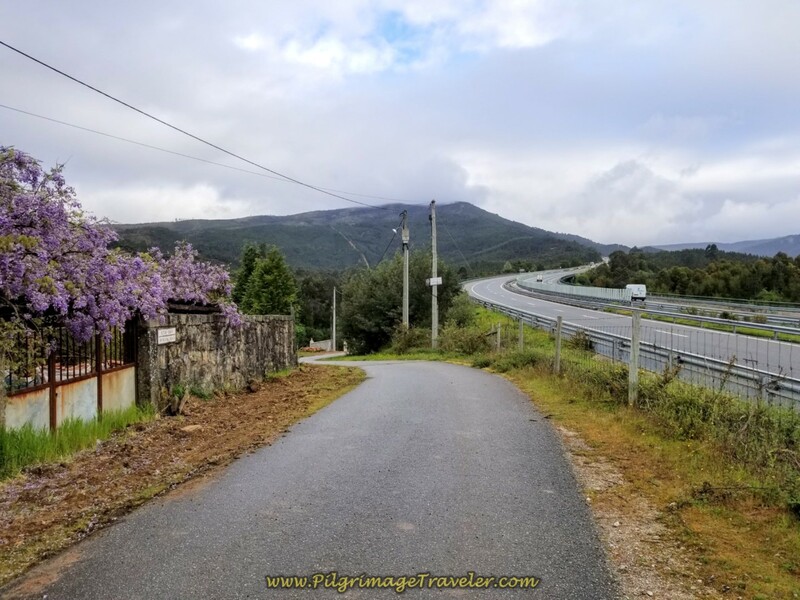 The Camino turns right onto the M1240-1 to bend around and come to a roundabout, turning left as you enter town and toward the church. 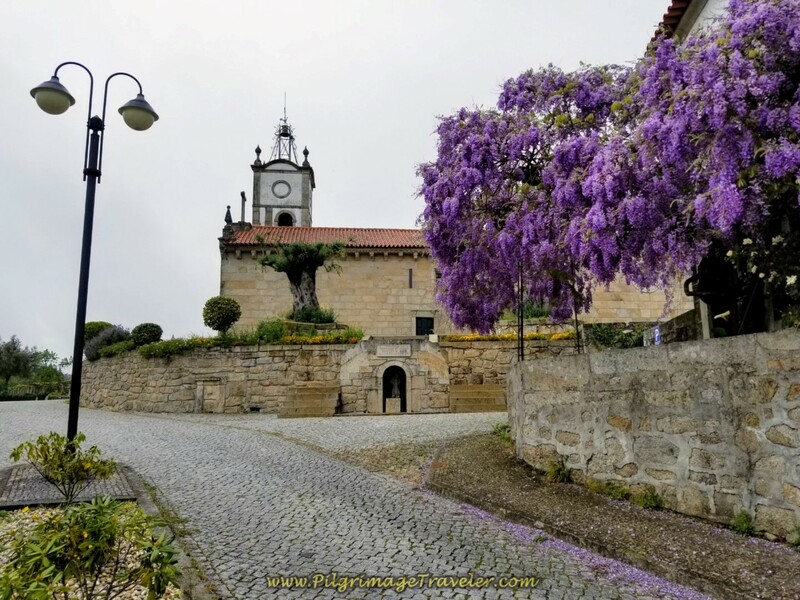 We walked by the church, the Igreja de Santa Marinha de Arcozelo, where the loveliest of wisteria vines were showing us the way. In the village, just beyond the church, the way to one of only two open cafés on day eighteen can be seen. 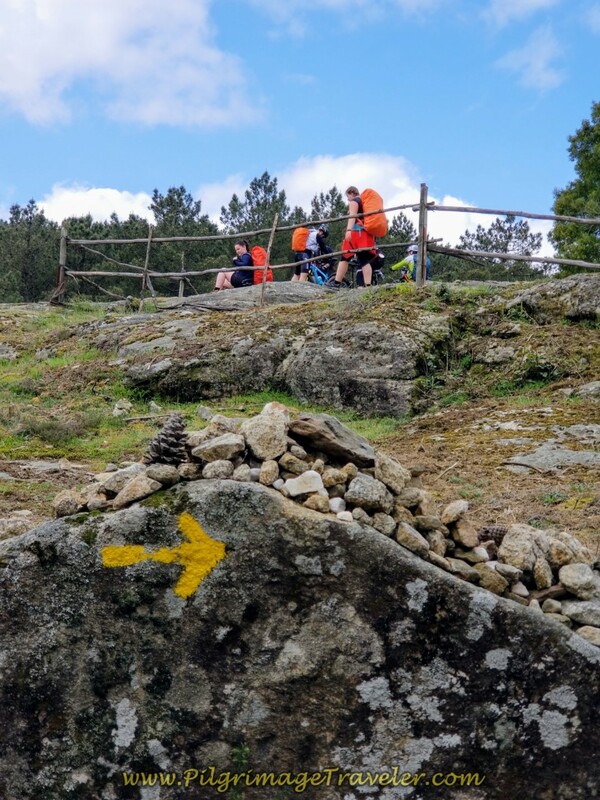 You must turn left, here at the sign and walk down a lane to the Café Veiga, about 100 meters to the west of the Camino. 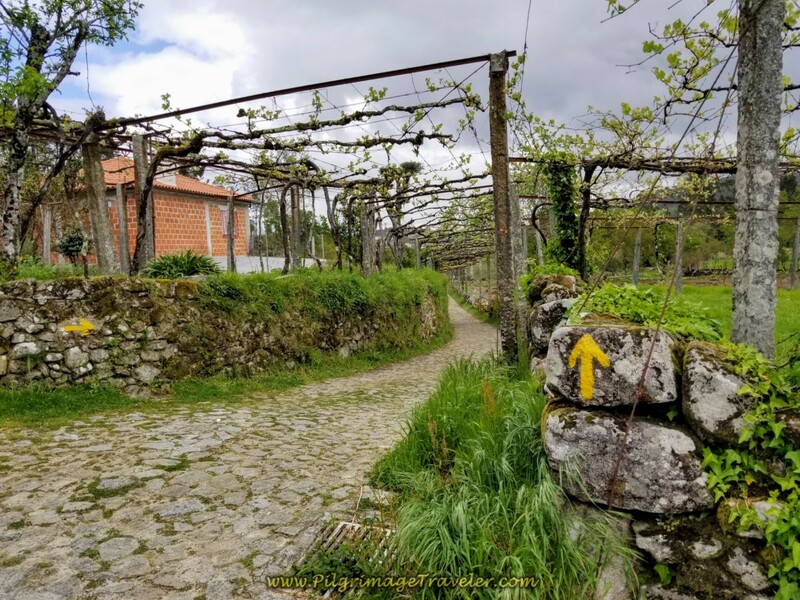 We continued to wind around the town, as the yellow arrows directed us to turn left onto this next lovely, grape-vine dotted road. 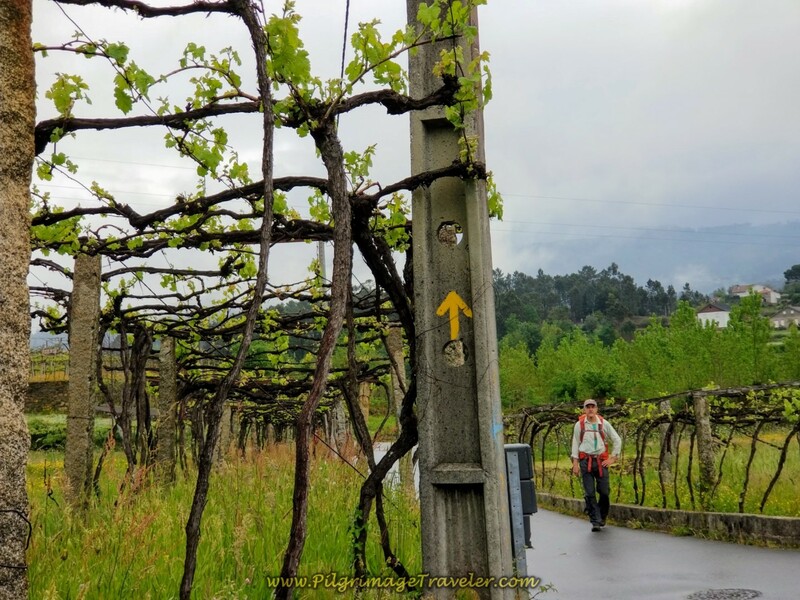 We soon turned right onto another path, walking through more glorious Arcozelo vineyards. 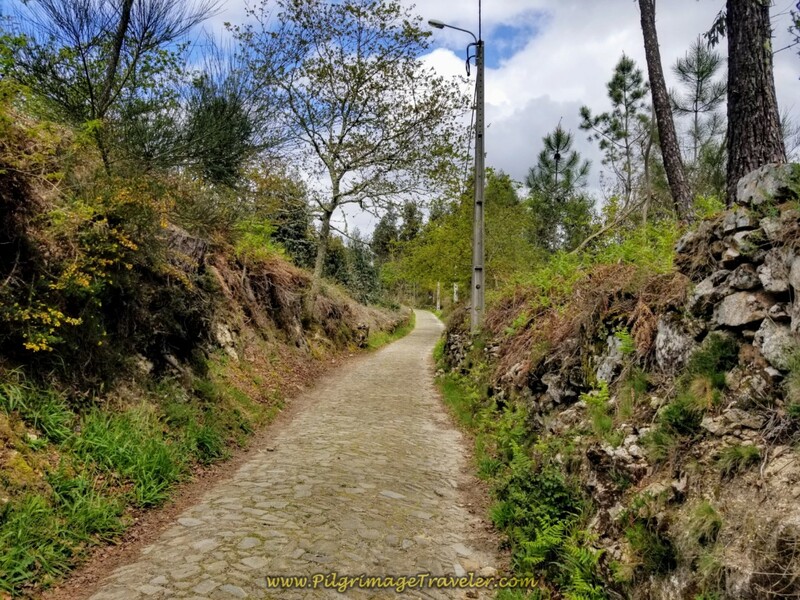 After not quite 1/2 kilometer, the path joins a paved road at a Roman bridge, called the Ponte do Arco da Geia. Shortly after the bridge, the Way turns left onto this side road and follows it through the fields. 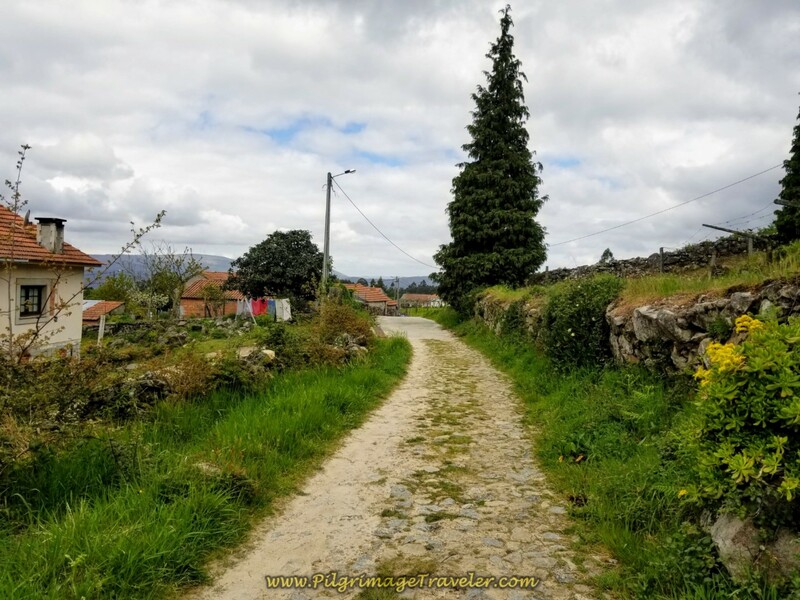 After walking a ways on a path, we eventually came to this T-intersection and turned left onto this lovely cobblestone road. This is authentic cobblestone in this area, not the pre-fabricated granite setts that you see mostly in the cities and elsewhere. 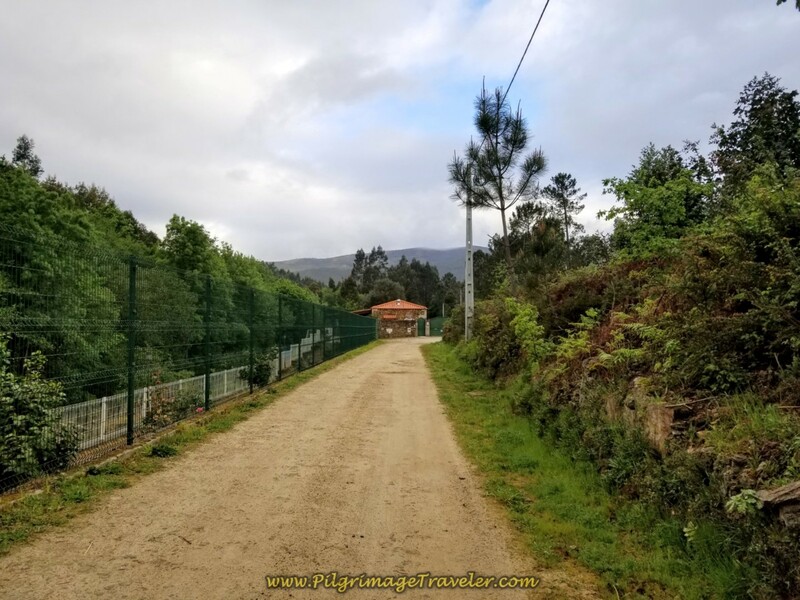 The building ahead, shown below is the Parque de Pescas a fishing park with a cafeteria that we passed after approximately 5.0 kilometers into day eighteen on the Portuguese Camino, central route. It was 08:30 when we walked by, and it was closed up as tight as a drum. I found some information about it on Facebook, but it appears that it closed October of 2017 and hadn't re-opened as of June, 2018. Plan accordingly! 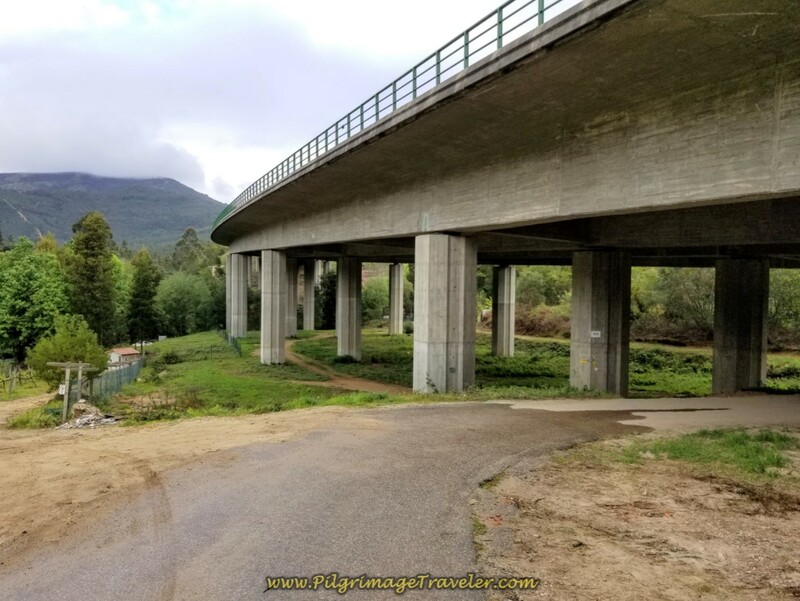 After passing the fishing park, the dirt road bends and joins this road, below that skirts the A3 then walks down and under it, pictured farther below. 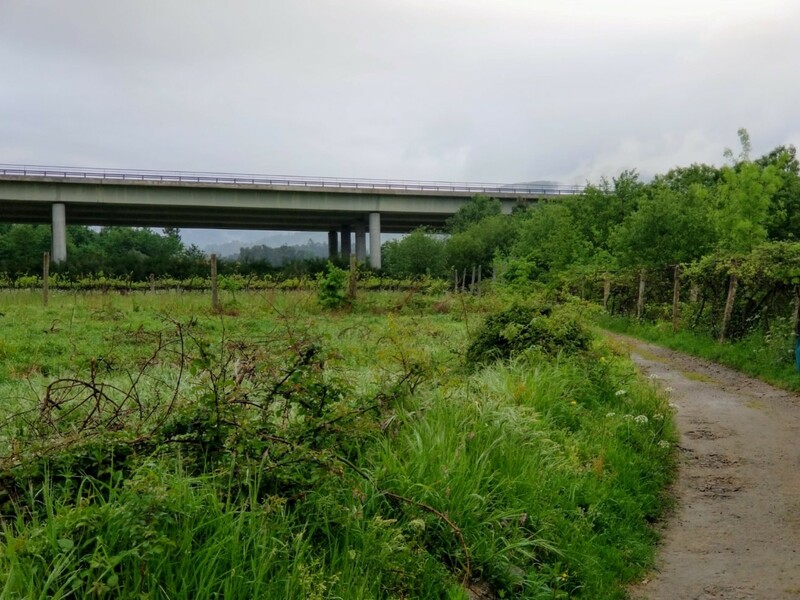 The Way then weaves around and under the A3, three times, as it crosses a bridge, below, with a "Welcome to Labruja" sign on the other side. 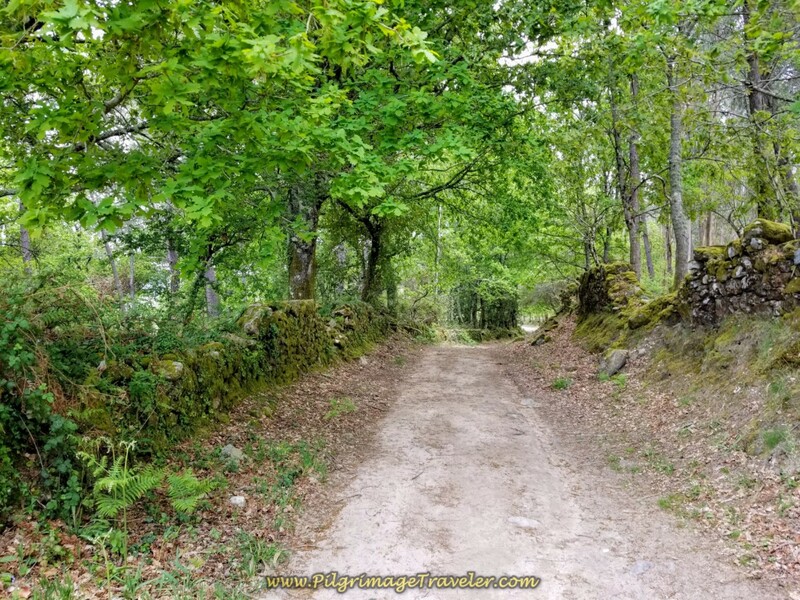 After leaving the pathway under the A3, the Way turns onto this dirt lane, below, and into the forest as it climbs a steep section that was muddy from the rain when we passed through. In about 300 meters, the road levels out, shown below. 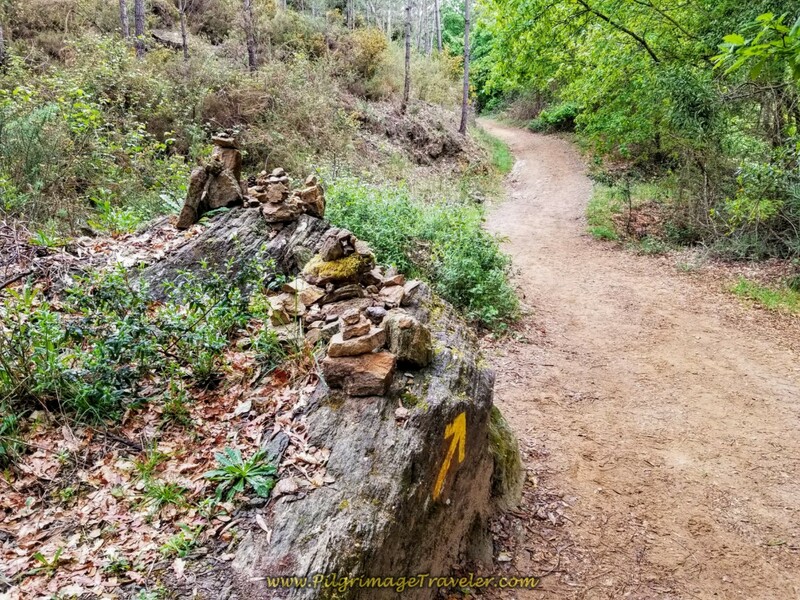 Then it's onward through the nice forest road, when in another 300 meters we passed by these meditation rocks. In about 1/2 kilometer more you come to waterfall. You can hear it for awhile before you can actually see it. It is a very inviting sound. 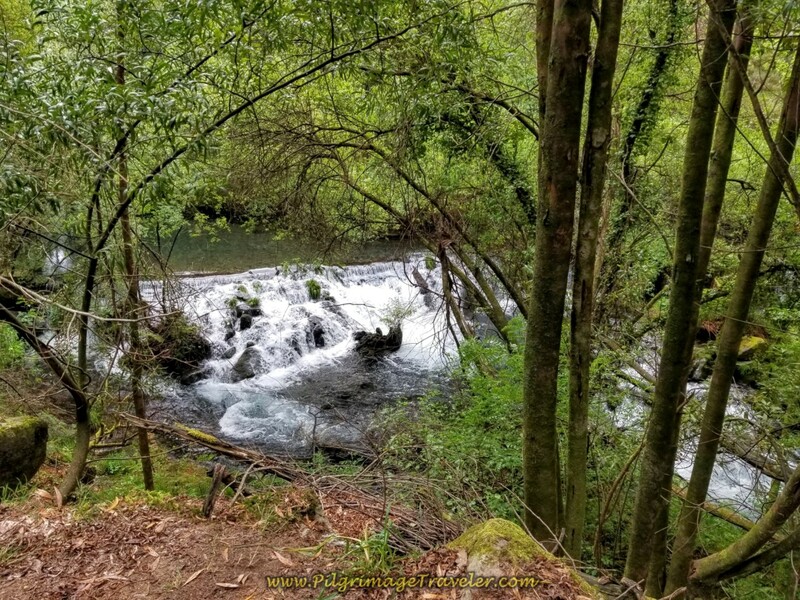 At first I thought it was just the sound of a creek, and was pleasantly surprised when we came upon the peaceful waterfall. 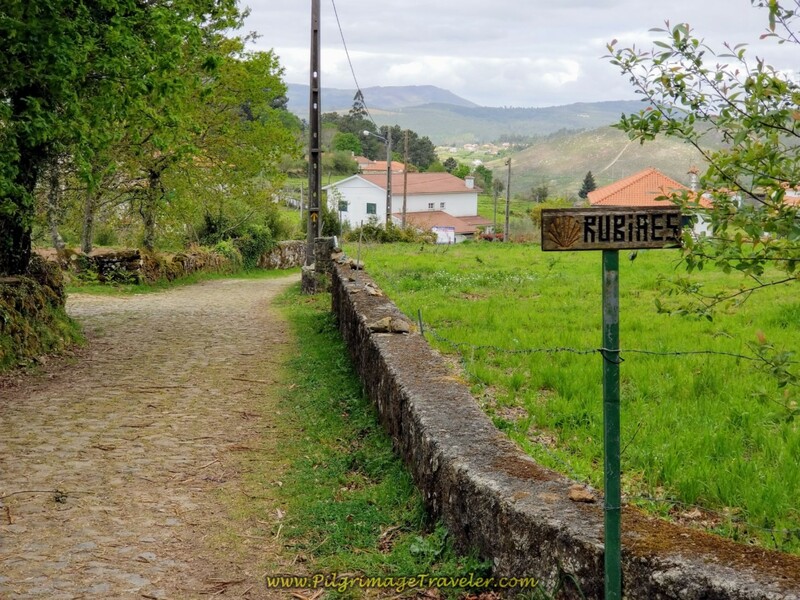 Just beyond the waterfall you come to the original Via Romana, here called the Rua de Paredes. 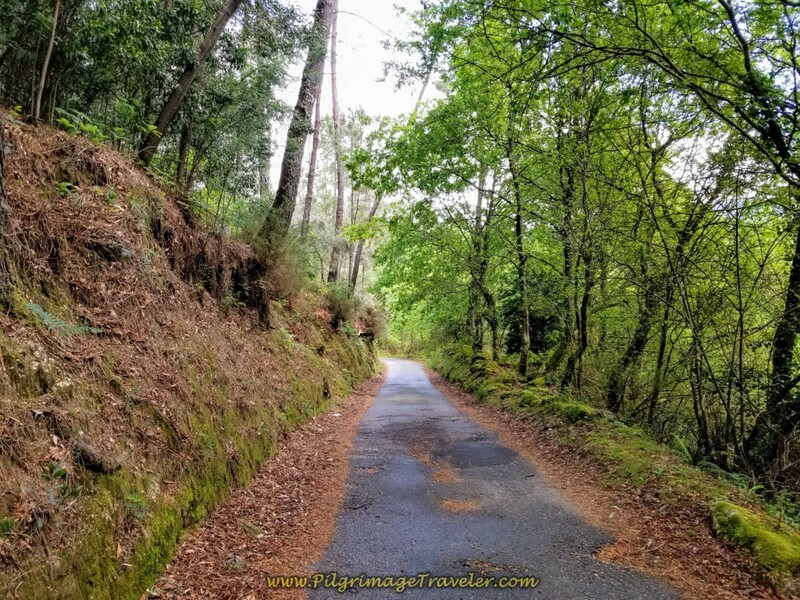 It is an historic and wonderful section of road. 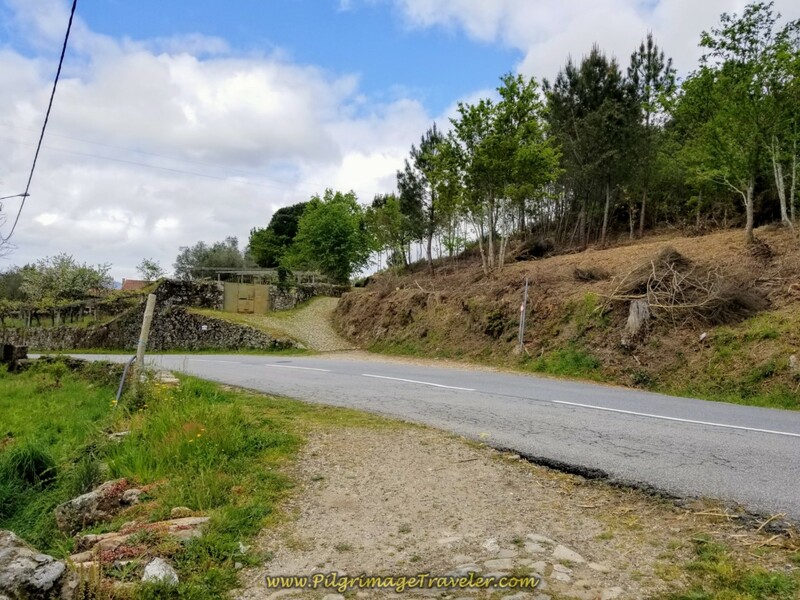 At the top of the hill on the The Rua de Paredes, the forest opens and you enter a cluster of buildings, following the road as it turns to the right and becomes the paved road, the Rua da Foz. This off-pavement section from the last bridge underpass to the Rua da Foz is a wonderful 1.5 kilometers of fun! Next, you come to a T-intersection with the M522 and turn left to walk by the sign for the next town of Arco. 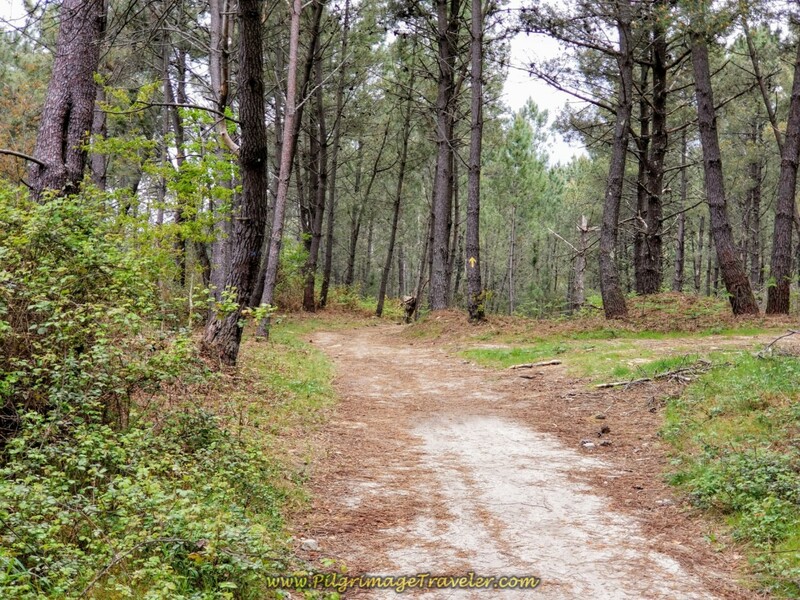 Follow the M522 for over a kilometer, and enter the next town of Revolta. A few steps onward and up a hill in Revolta there is a little chapel, shown in the next photo, which is open for pilgrims. There is a café across the street, not pictured, called the Café Nunes. Since this was the only café open on this day eighteen of the Central Route on the Camino Portugués everyone was stopping here! There were about 30 pilgrims coming in all at once. There was no table waiting, but pilgrims lined up at the counter to order and collect their order afterwards. What a three-ring circus! My GPS showed the Café Nunes is about 8 to 8.5 km into the day. 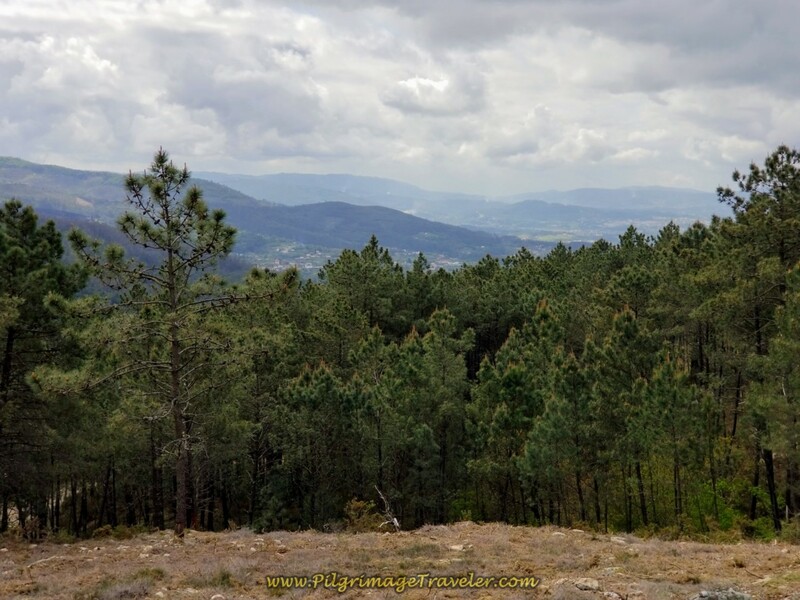 It is the last café before the big climb up the mountain, and the last until you reach Rubiães, 10.5 kilometers away. Is it any wonder that everyone was stopping here? We ordered our coffee and left as soon as possible. 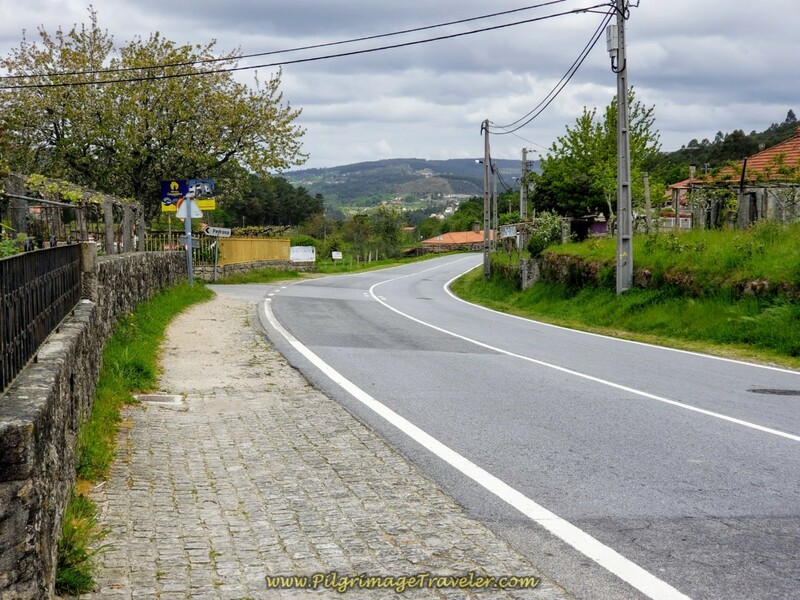 After leaving Revolta, turning to the left by the Capela, the paved road is a pleasant and rural one, shown below. 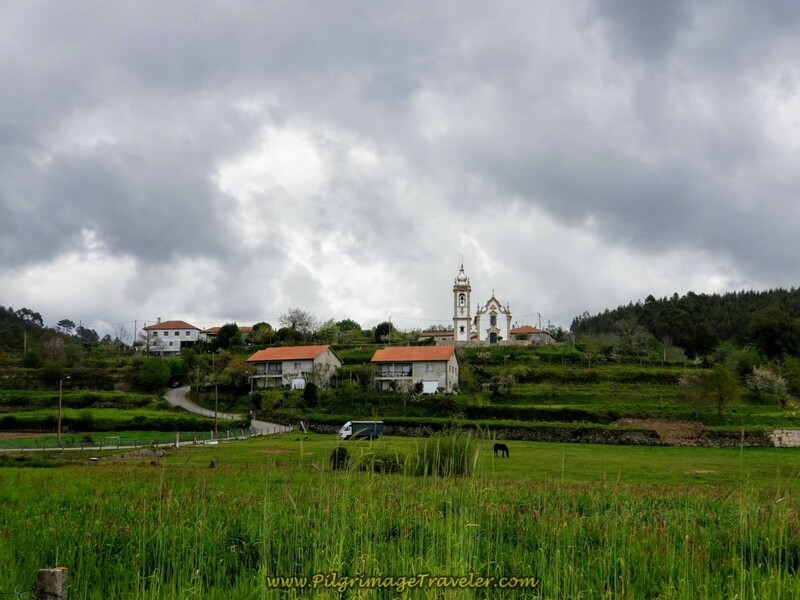 One kilometer later, the town of Labruja appears ahead, with its church dominating the skyline. 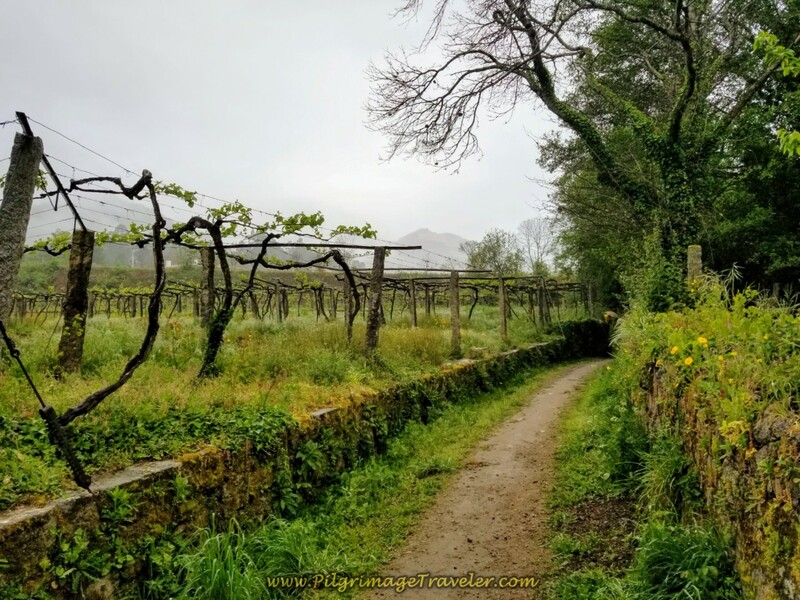 400 meters later, we came to the newly-opened in 2018, O Conforto Albergue, with an amazing view of the church and the valley below. It is located just under 10 kilometers into the day and had the staging been different, I would love to have stayed at this fantastic-looking place. Then it was onward, after the albergue, staying right here, to join the M522 once again, shortly thereafter. 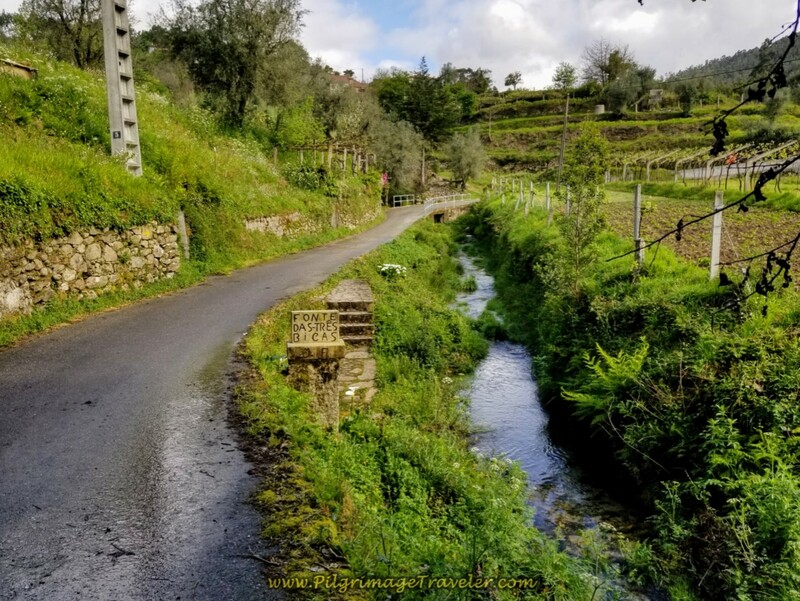 Walking only briefly on the M522, for about 100 meters, and the Way veers to the right, onto this quaint road below, the Rua da Fonte das Trés Bicas, or loosely translated, The Street of the Source of Three Spouts (fountains). This landmark fountain can be seen shortly onwards, 50 meters or so, shown below. 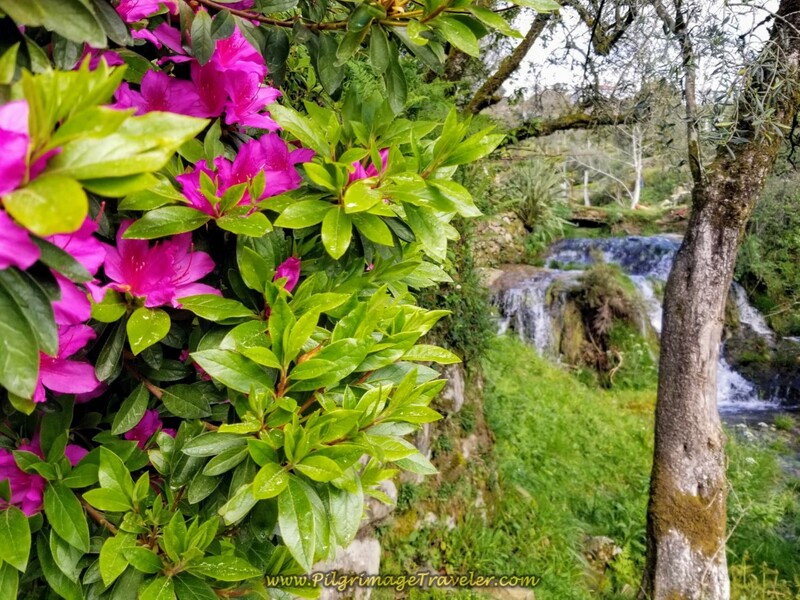 Just beyond the Fonte das Trés Bicas, a potable water source and safe to drink, is this lovely waterfall and a picnic area if you need a place to take a break. The spring azalea bush was too gorgeous not to pause and photograph! 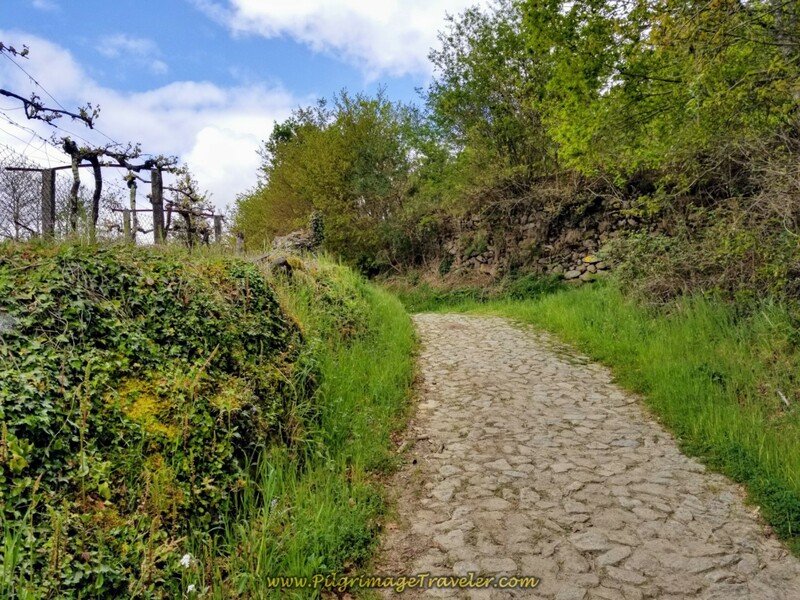 The Camino onward meanders around, but does not join the M522, and turns to cobblestone. Here are two photos of it at its peak charm. 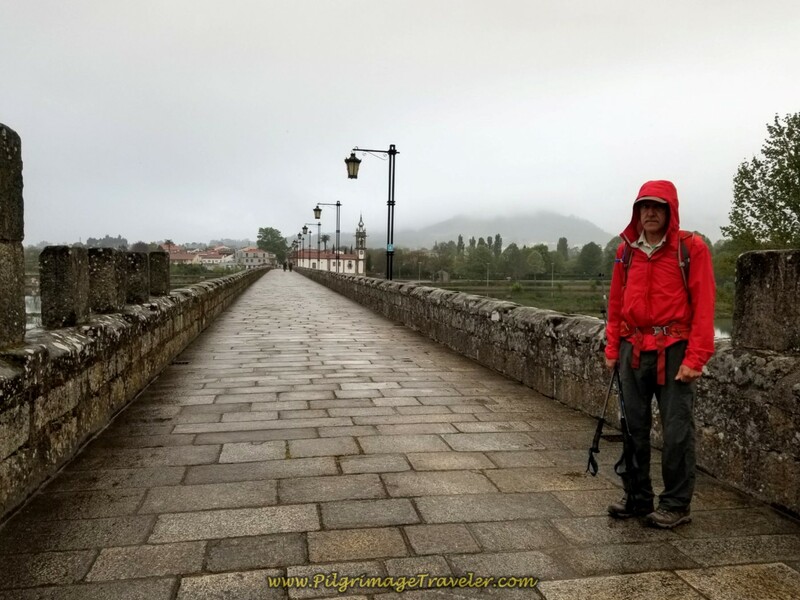 In the second photo you can see the large yellow rain cover on the pack of Michal, from Poland, with whom we would chat this day, and eventually he would join our Camino group. We crossed the M522 here and turned off onto this path shown below, northward and toward the Labruja mountain. 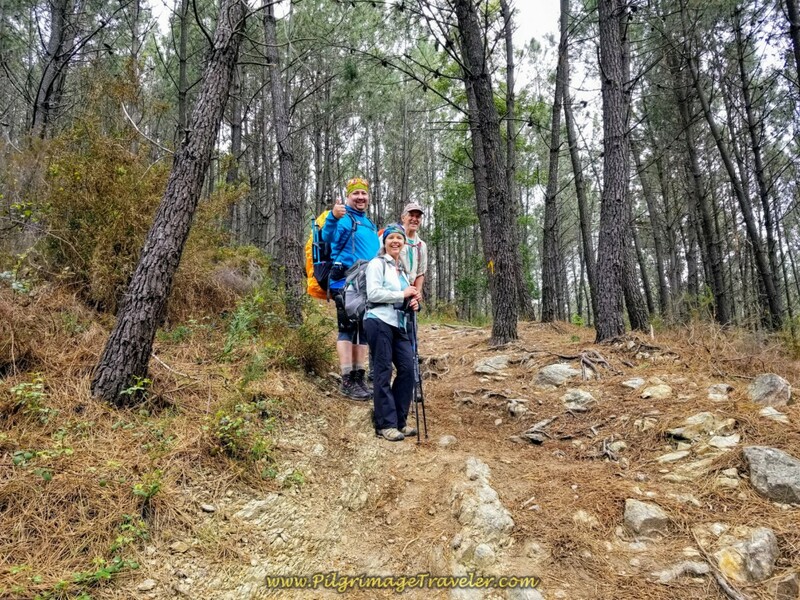 We continued onward on the dirt path, widening into a road, as we entered the forest and away from civilization for about one kilometer, on not-so-steep terrain. Then the real climb begins! 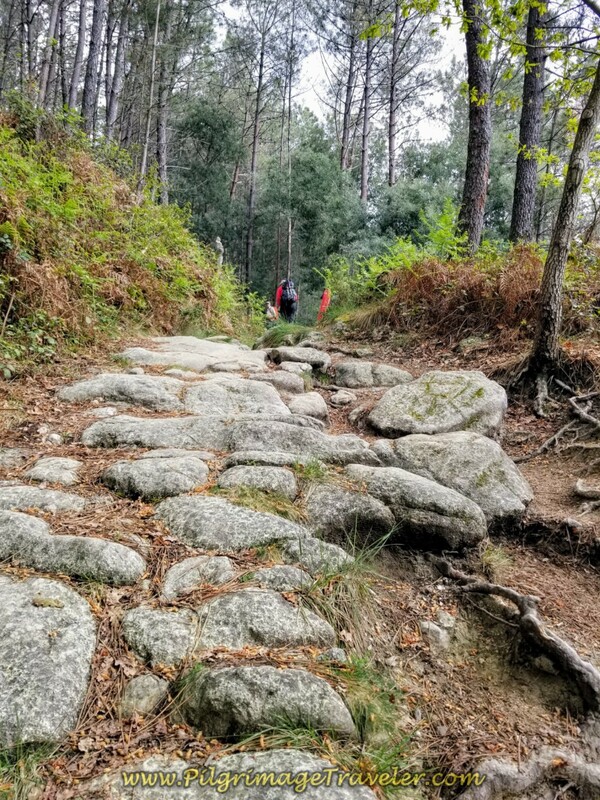 We joined the rocky ancient road shown below. We stopped to catch our breath in this steep section, below. A kind pilgrim took this shot of us and our newly-found friend. Just when we thought it couldn't get any steeper, it did! 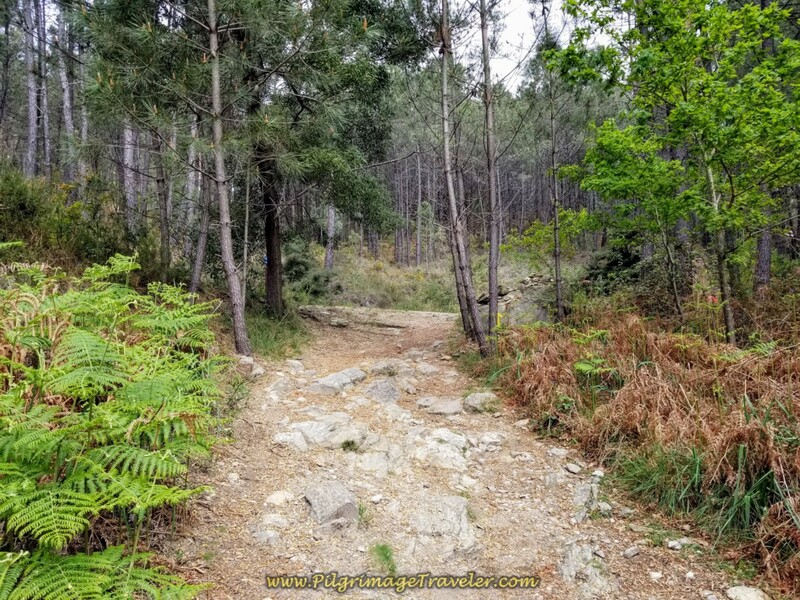 This really rocky and steep section below is just before the Cruz dos Franceses (the French Cross), also pictured below. 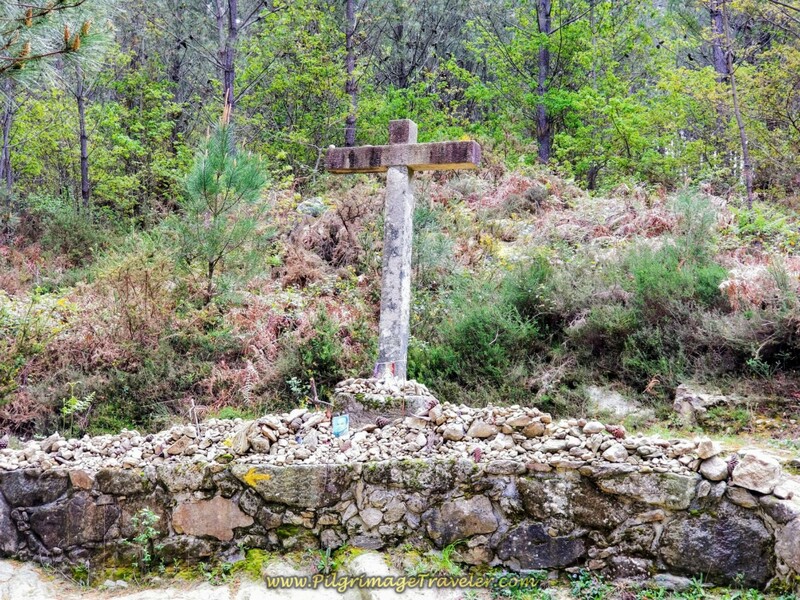 This cross is the equivalent, I suppose of the Cruz de Ferro on the Camino Francés. 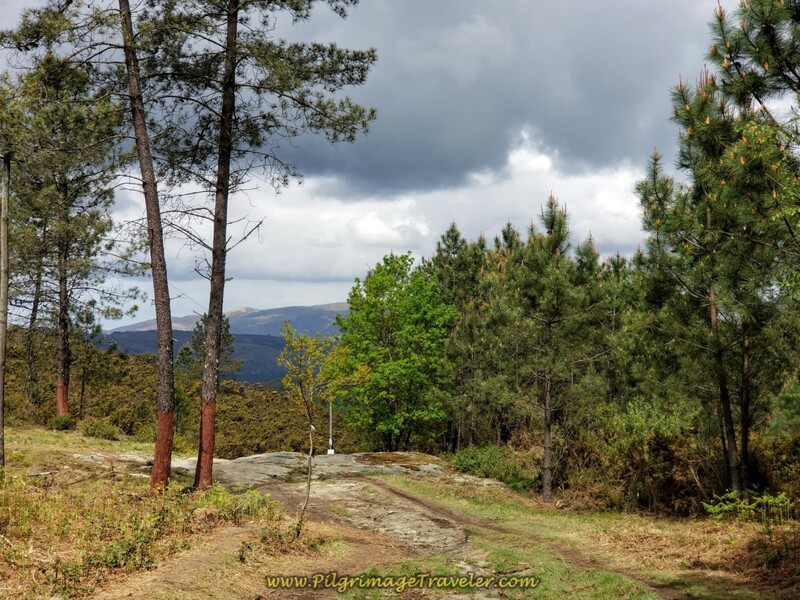 Take heart, because when you reach the French Cross, you are only about 300 meters from the top! 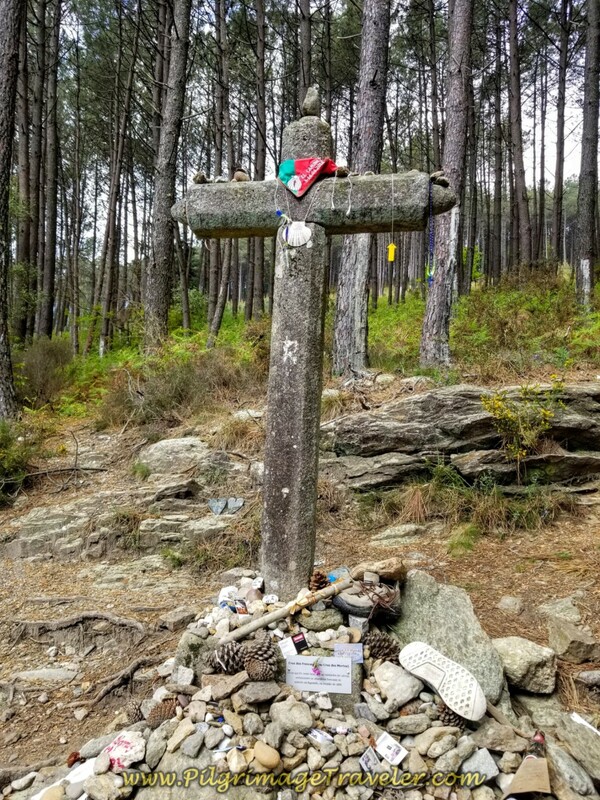 We paid our respects at the cross on the central route of the Camino Portugués on our day eighteen. I call this next section the "hike-a-bike" section, because the bicyclists ahead are carrying their bikes on their shoulders! That is how difficult this final section is. Take your time and enjoy the ancient road. There is no competition and you have plenty of time to reach the top. Remember ~ those who know themselves are enlightened! We continued to climb and suddenly, above us was the top! 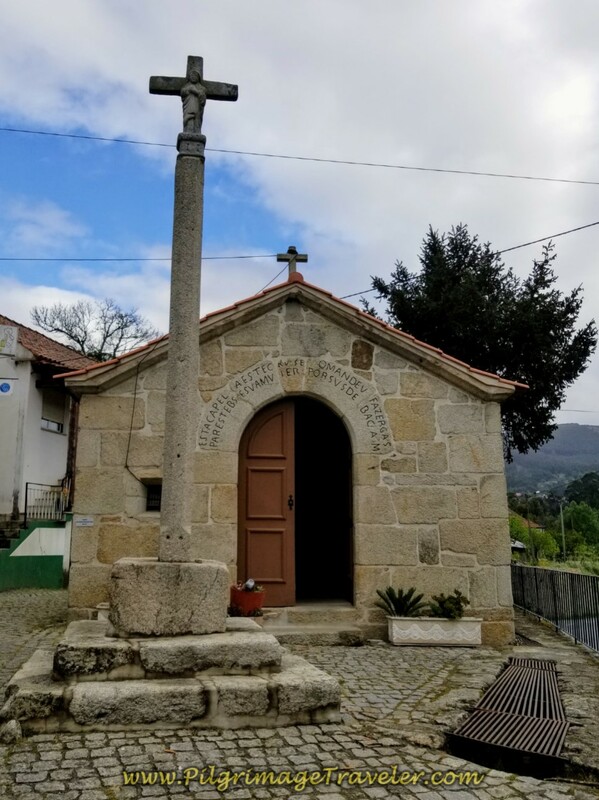 The famed Alto da Portela Grande de Labruja. We reached the top after 12.89 kilometers on my geotracker app. 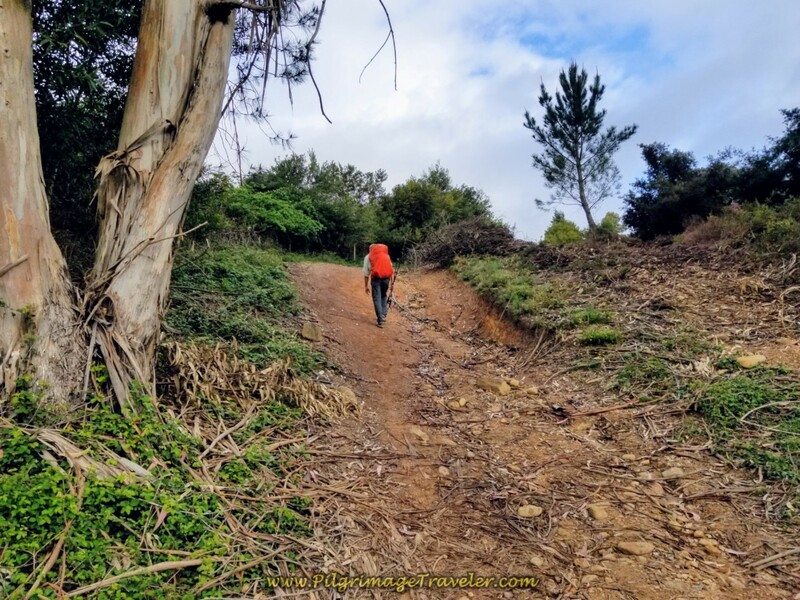 All-in-all, the really steep, rocky and tough part of the day is only about 1/2 kilometer, even though it feels much longer! There is a sign at the top letting you know that water is available if you need it. Here is the viewpoint from the Alto. We hung around and rested and had a bite to eat, to ready ourselves for the final 6.0 kilometers. There was no hurry on this shorter day. My mind wandered to Magdalena and again, I was grateful that she knew herself and the wisdom of her choice. 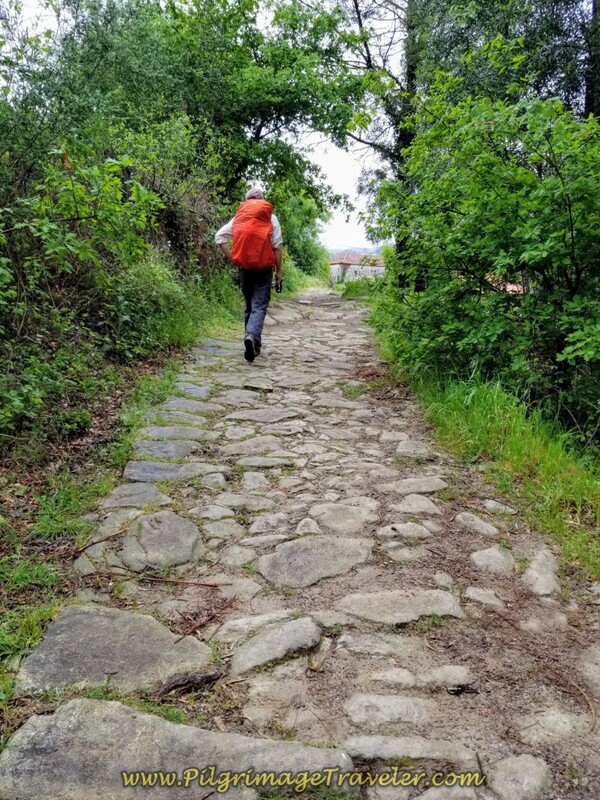 Bringing her up this Roman road would have been near suicide for all of us. I didn't know where Matt, Magnus and Borut were on this day, but I knew we would meet up in Rubiães down the road. They probably were behind us, as they liked to sleep late when possible. We did not see them all day on our walk. 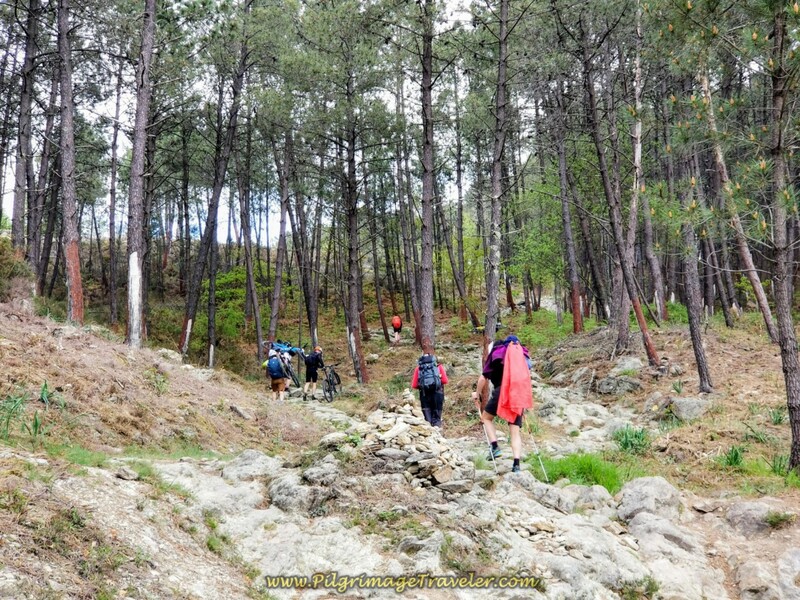 After resting, we set off on the flat mountaintop, following the well-waymarked route. The weather appeared to be threatening rain, as we peered down the mountain on the other side. Here is a photo of the downhill side. It is almost as bad as the uphill! The Way was very, very steep and muddy from the rain. I hoped it wouldn't rain again until we got through this section! 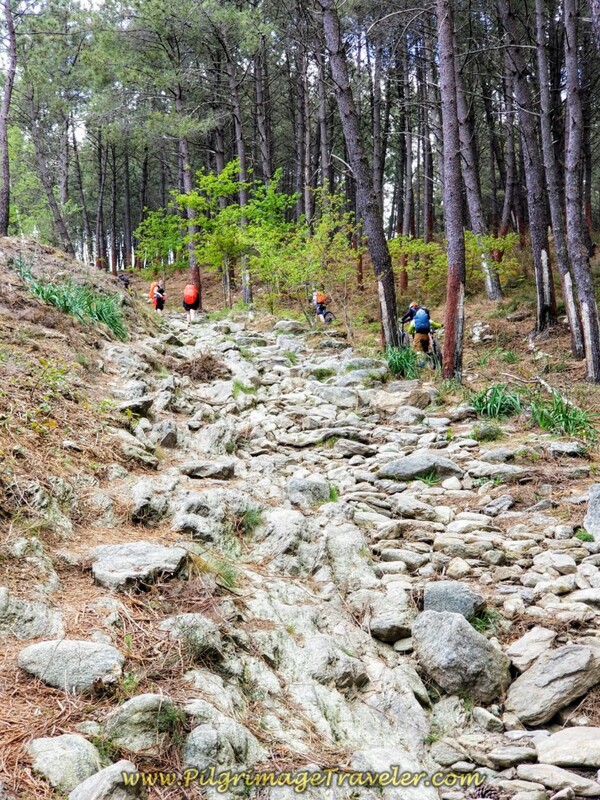 The Downhill, Almost as Steep and Rocky as the Uphill! 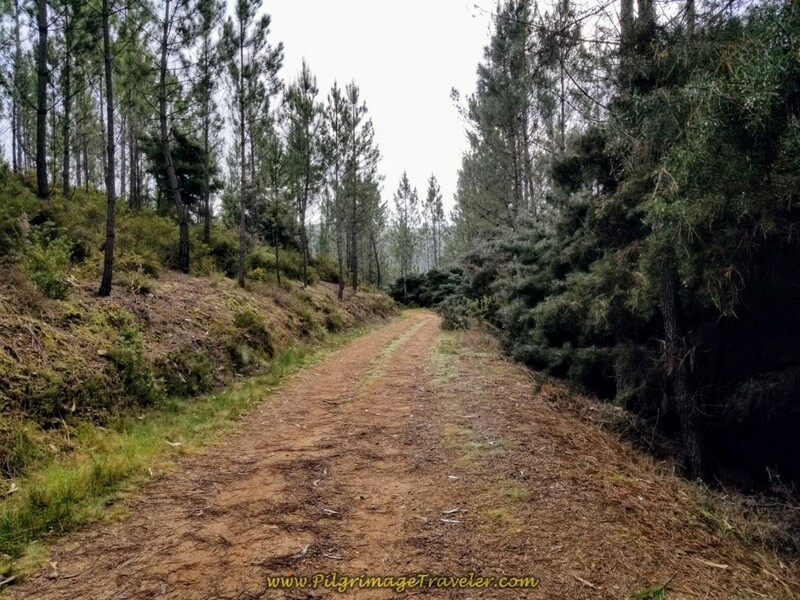 And then the route flattens and smooths out as you soon walk by a wooden sign, in the middle of the forest that lets you know you are entering the next town of Águalonga. 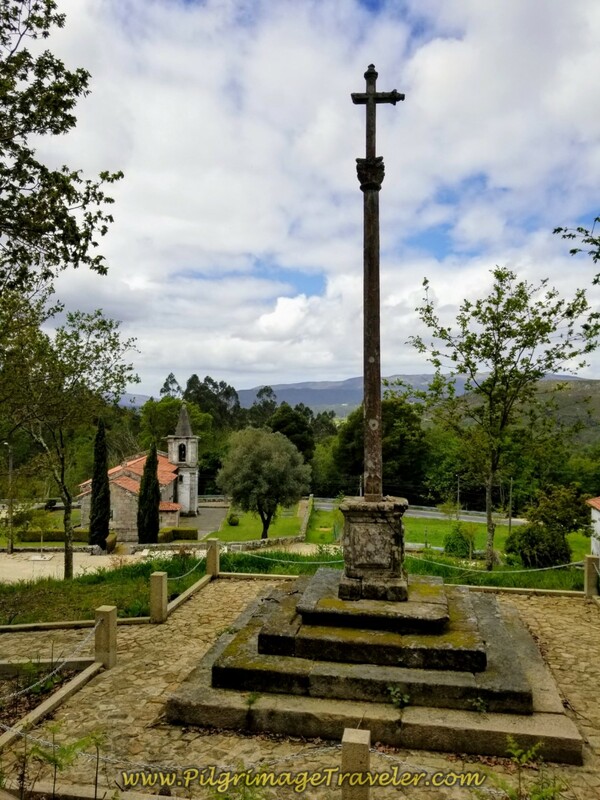 The Águalonga sign is directly across from this cross, below. The cross is seen after almost a kilometer from the top. 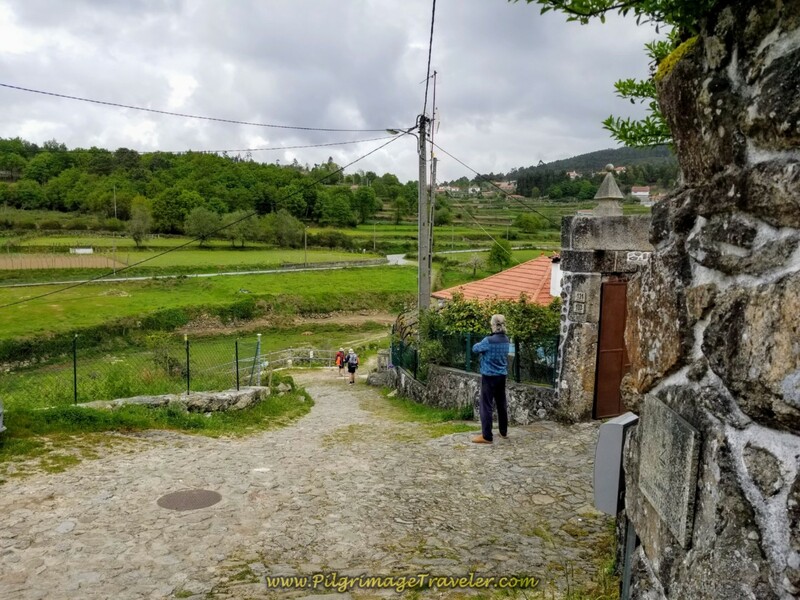 Then the forest opens in another 300 meters from the cross and we came to a cluster of buildings, near the town of Romarigães, shown below. 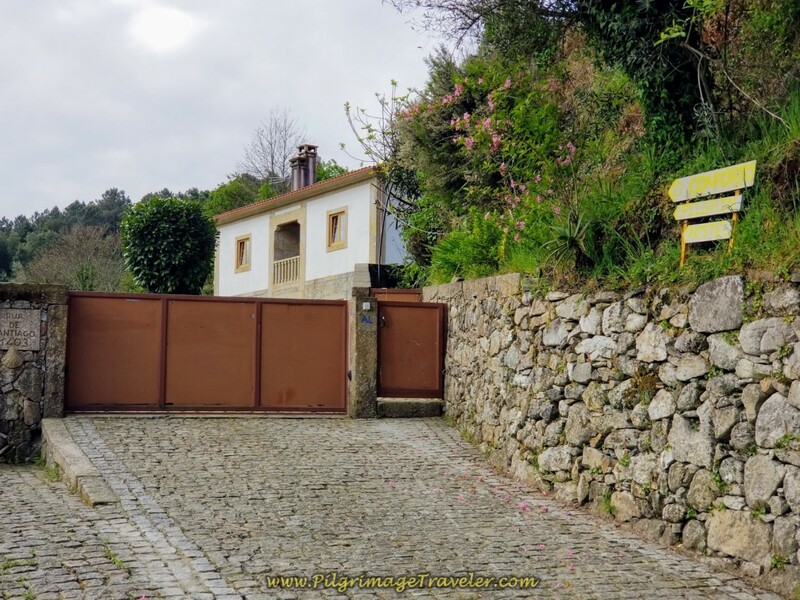 A few meters onward is the Quinta da Preza. 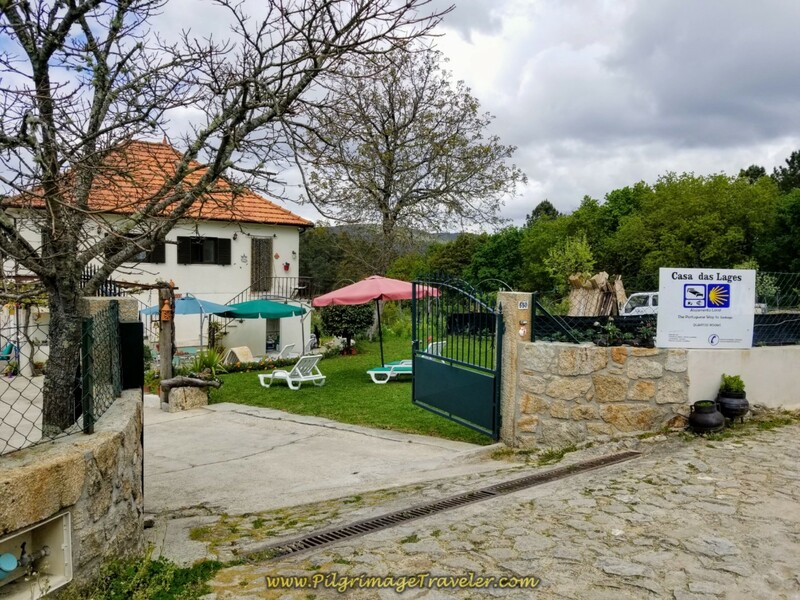 A rooster crowed, drawing our attention to the Quinta, rated 9.5/10 on booking.com. Click the link if you are interested in staying here. I thank you for using my site as your referral! 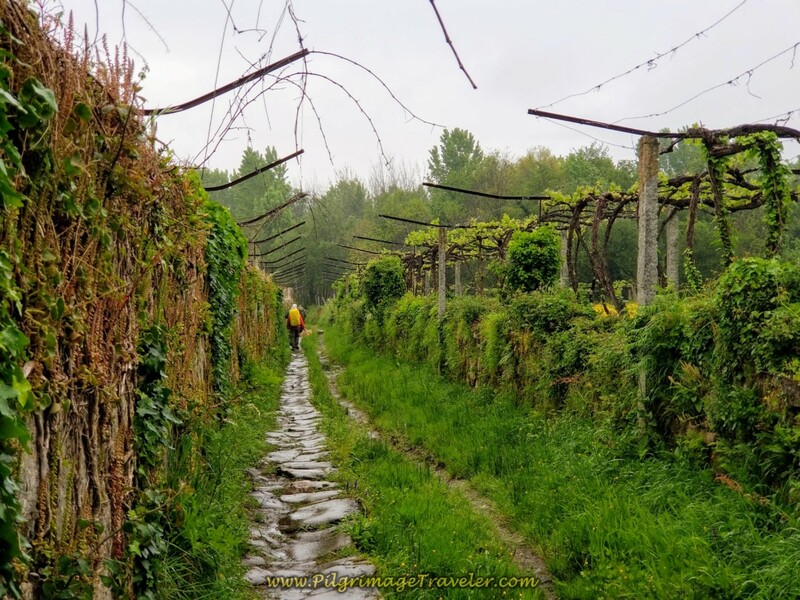 We crossed a paved road, to enter another cobblestone one, with amazing grape arbors to harbor us. 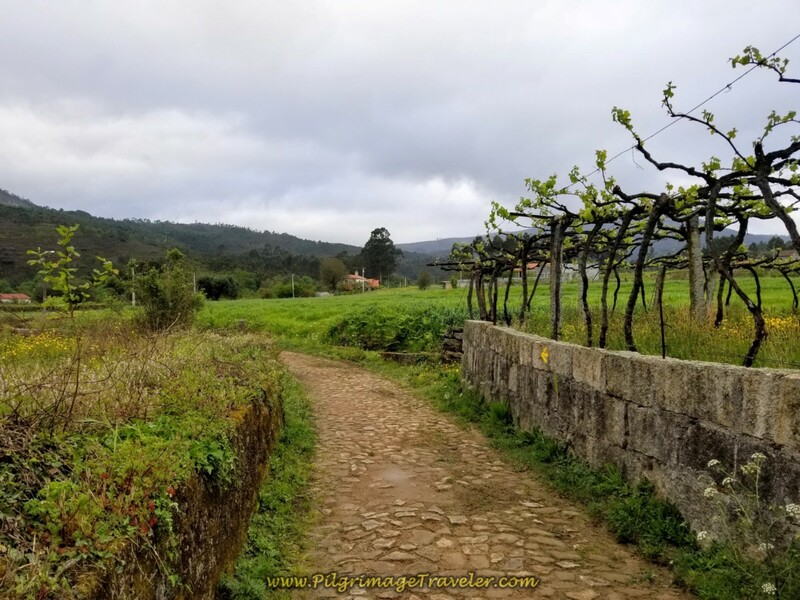 I do love the Portuguese countryside and day eighteen of this central route of the Camino Portugués was no exception! Walking on through a cluster of buildings, a local entertains himself watching the peregrinos go by! 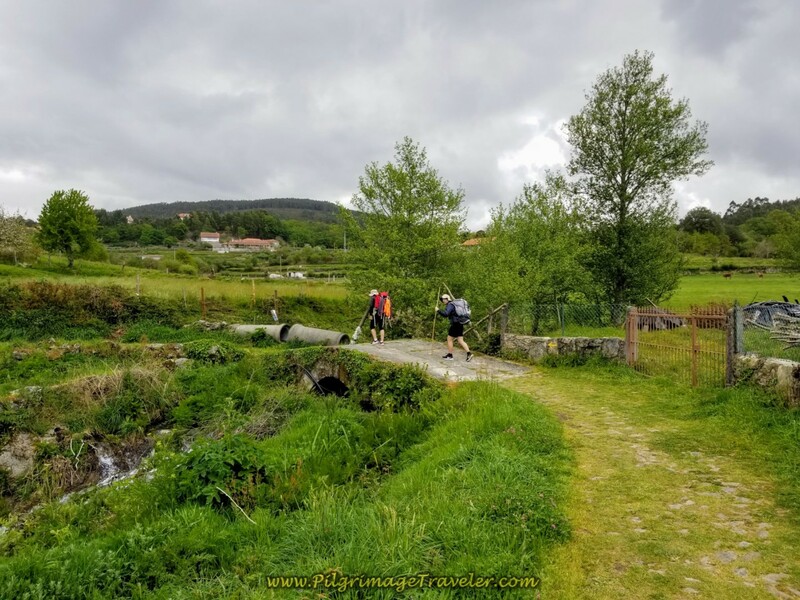 Here are two peregrinos crossing yet another Roman bridge, this time a small one. The church, the Igreja Matriz de Águalonga (São Paio) loomed on our right after we crossed the bridge. The sky still threatened, but no rain! We climbed up a small hill from the bridge to see this shrine. 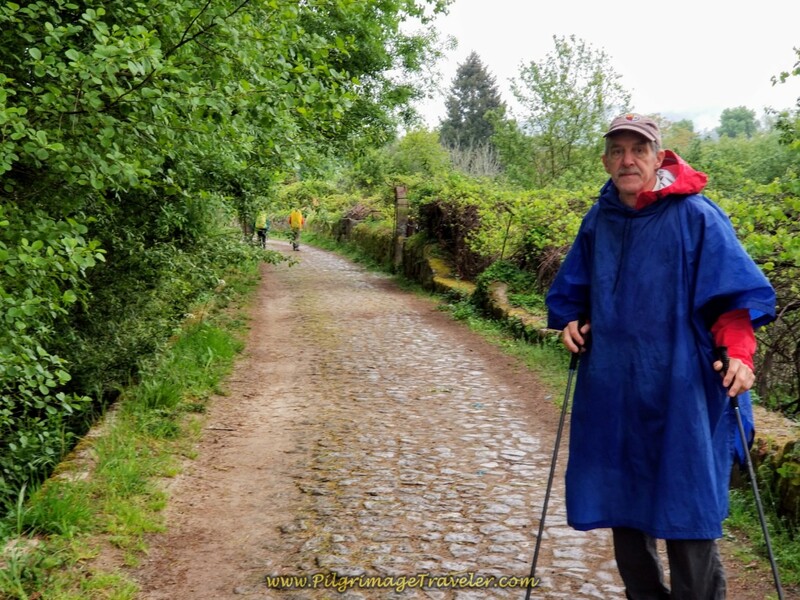 There seemed to be a lot of cobblestone in the last kilometers of day eighteen on the central route of the Camino Portugués. 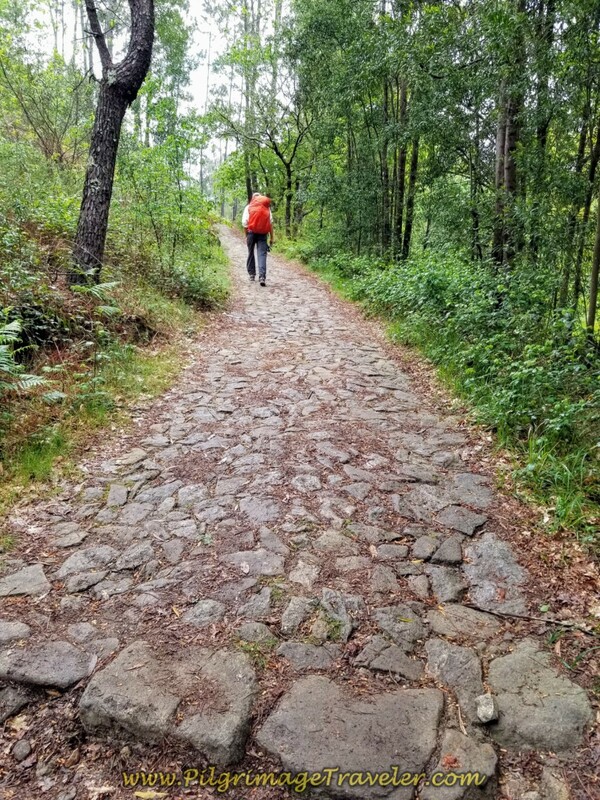 We fondly started to call it "hobblestone" because it was very hard on our feet and legs. I couldn't help thinking, only one more day of cobblestone, before crossing into Spain! ...and enters Rubiães as shown by this sign, below. And then the Way joins the N201, turning right. 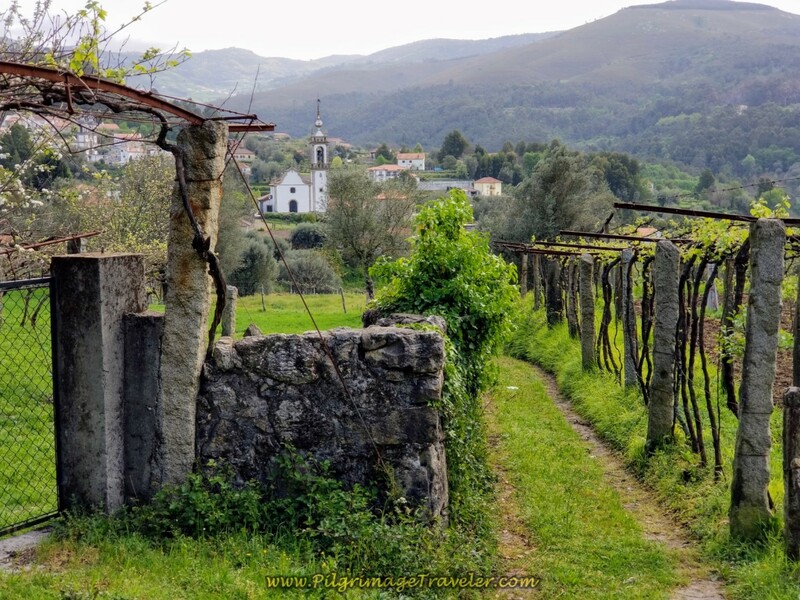 You stay on the main road only briefly, as you walk by the Albergue de Alojamento Local Constantino. 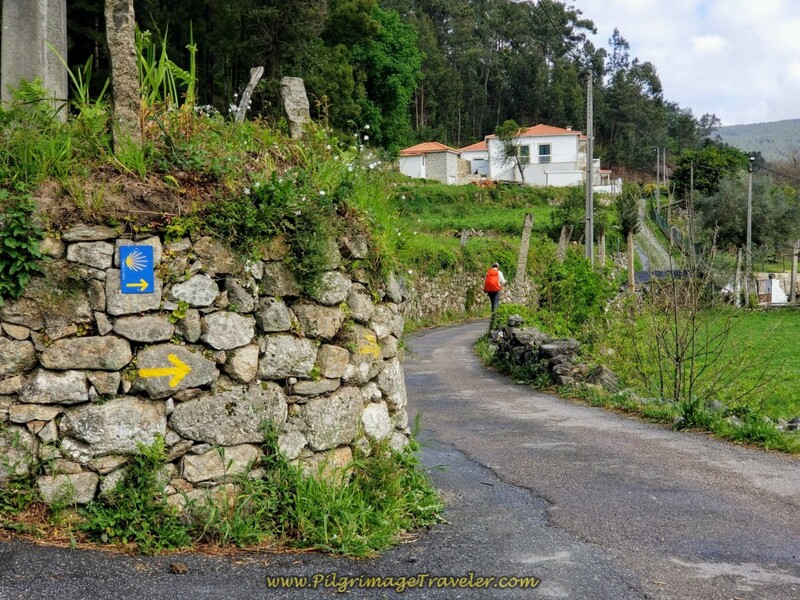 Just as soon as it joins it, the Camino leaves the N201, turning right here at this capela. 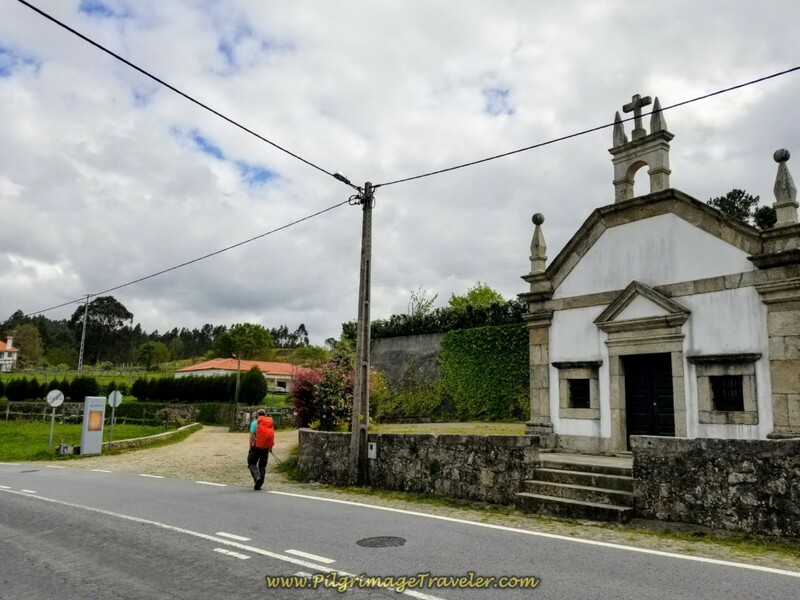 Next, you walk by the Quinta das Leiras and the Casa das Lages, two country homes that both look like fantastic places to stay. We walked onward. You re-enter the forest and come out at the neglected Igreja de São Pedro de Rubiães. Within about 120 meters from the church, the municipal Albergue de Peregrinos de São Pedro de Rubiães appears. 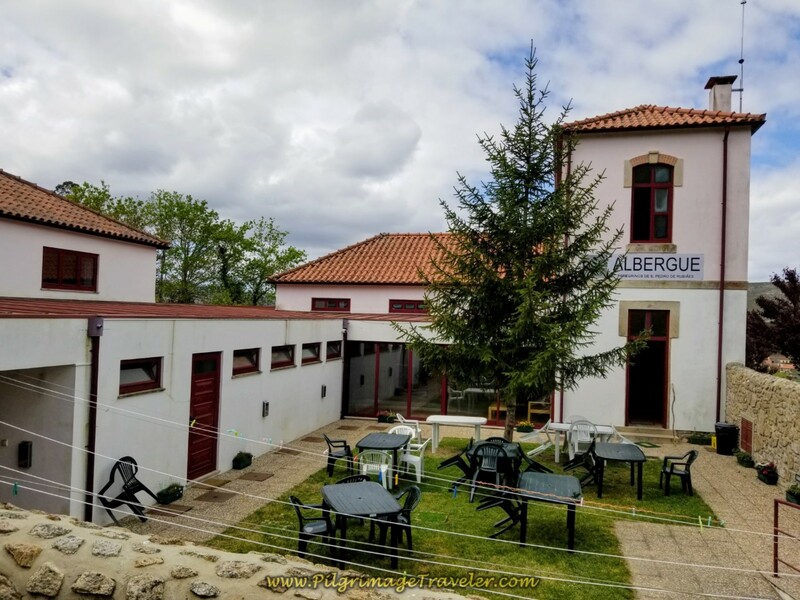 This albergue is quite large, with very large open rooms. We walked onward. 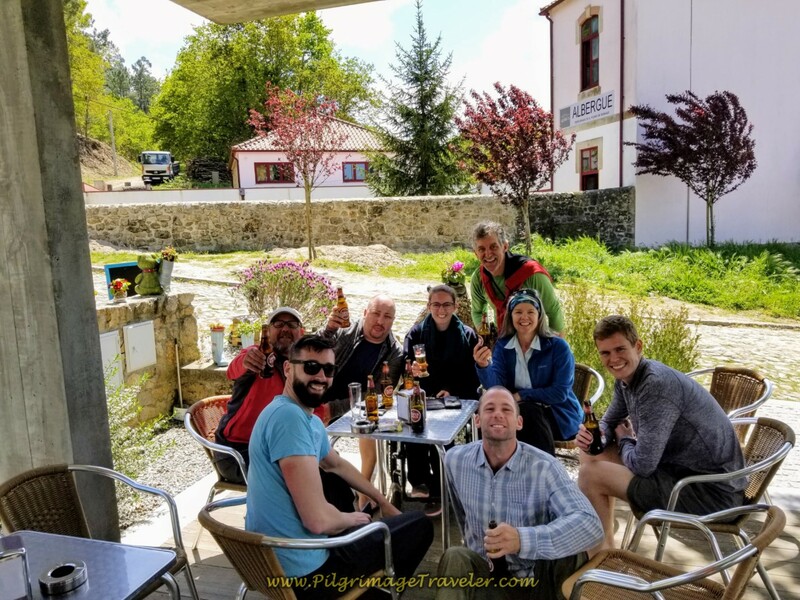 Just across the road from the albergue is the Café São Sebastião, where we all met up later to have a raucous happy hour! Rich and I continued on down the hill, turning right on the N201, past another Via Romana waymark (with a Roman horse and chariot) and an information board. 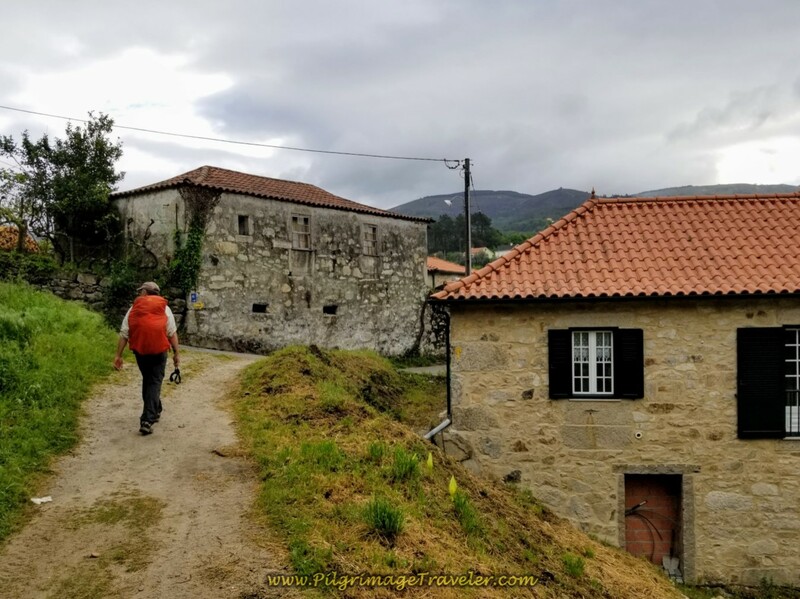 We noted the next private place to stay, the Casa de São Sebastião, on the right, just behind the Café where we had happy hour. They were under construction, building new rooms when we were there in June of 2018. 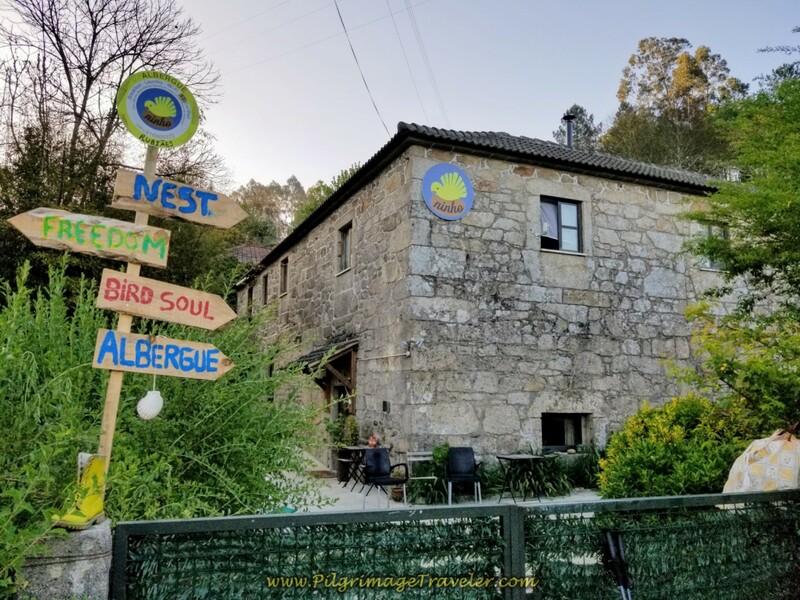 Our desire was to stay at a smaller, private albergue, just a few steps farther, the Albergue Ninho, shown below. The place, known as the "Pilgrim's Nest," (note the yellow bird on the building) is enjoying success as they also add more rooms. It was easy for us to see why this charming place fills up. 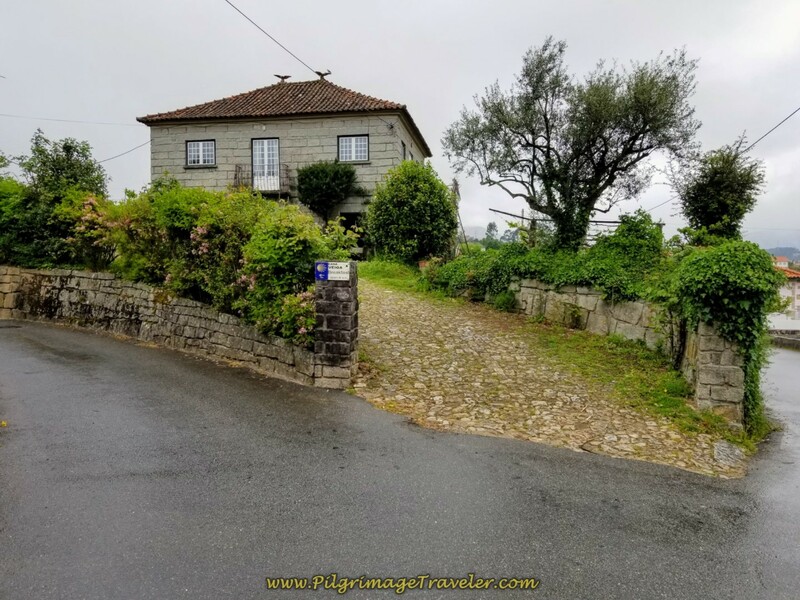 This wonderful old stone house has a unique kitchen and main sleeping area in a loft-like setup, then additional rooms are available in various configurations. Rich and I took a room that slept three, however, a third person never materialized so we had the room to ourselves. Much better than the muni's large rooms, and only a few euros more. All of our group, except for Magdalena and Michal, decided to join us at the Ninho. 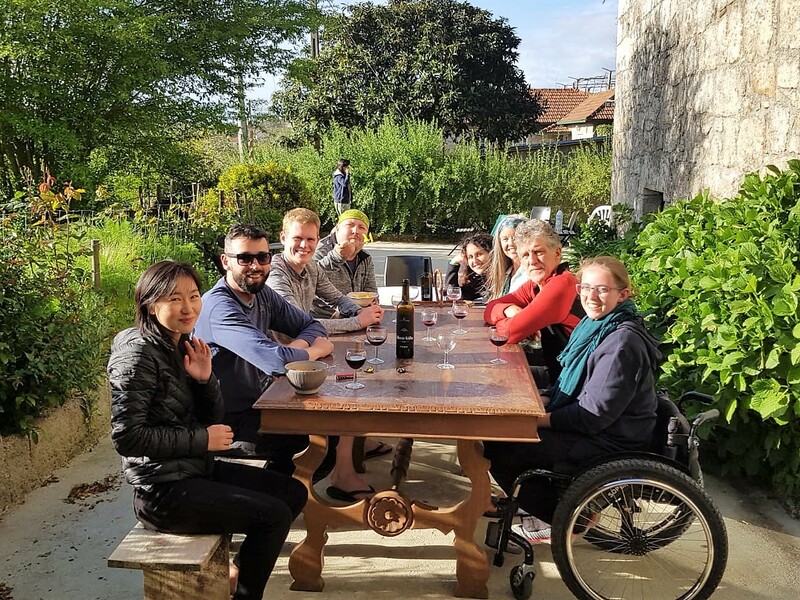 After our happy hour, we met a delightful Italian woman, Miriam, at the Ninho, who the guys bribed into cooking us all Pasta Carbonara for dinner! She agreed to cook in exchange for the meal. 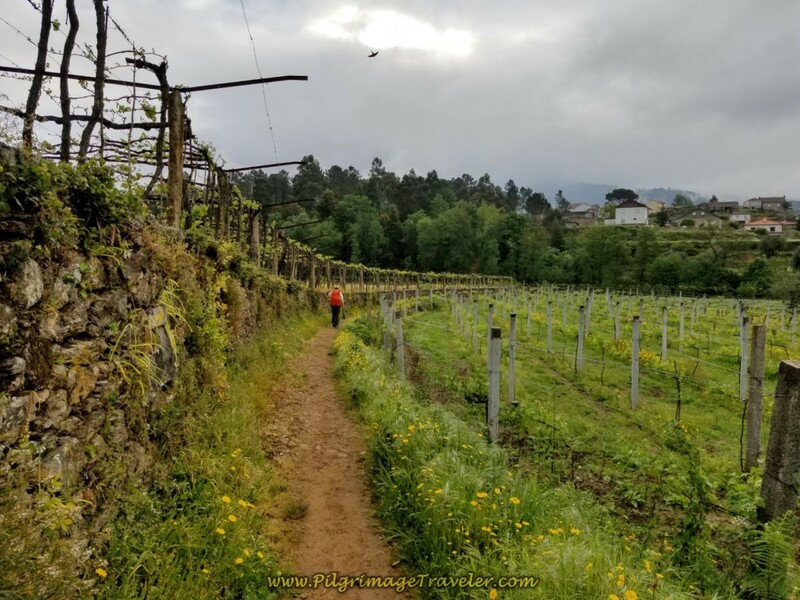 The guys walked farther down the hill to the nearby grocery store, (see the map above for its location) for the ingredients for dinner, and of course, wine! Miriam made a wonderful meal, which we all enjoyed immensely! Magdalena wheeled down the hill with Michal, to join us for dinner. It was a perfect ending to an almost perfect day. The large courtyard at the Ninho was more than accommodating for a meal al fresco. Fabulous Pasta Dinner Al Fresco! 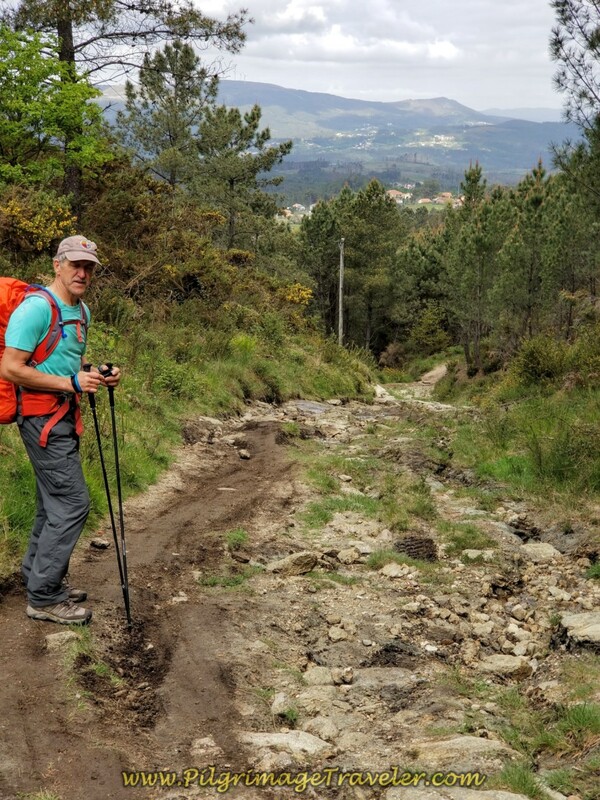 This day was one of only a few of my many days on various Caminos that I had absolutely no issues! 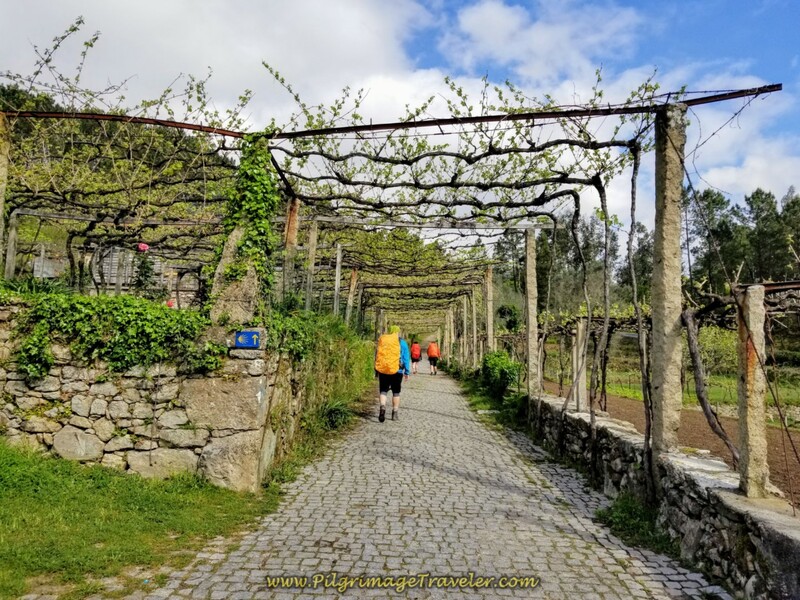 It was a perfect length for me, a perfect challenge as far as effort, was filled with the charm of the Via Romana, forests, waterfalls, Roman bridges and delightful Portuguese villages and countryside. If I were to know myself to the fullest, I would know that days like these are extremely rare and are to be treasured as soon as I recognize them. While it is most likely that I will never overcome myself in this lifetime, it's times like these that I can see a glimmer of hope that it just might be possible! 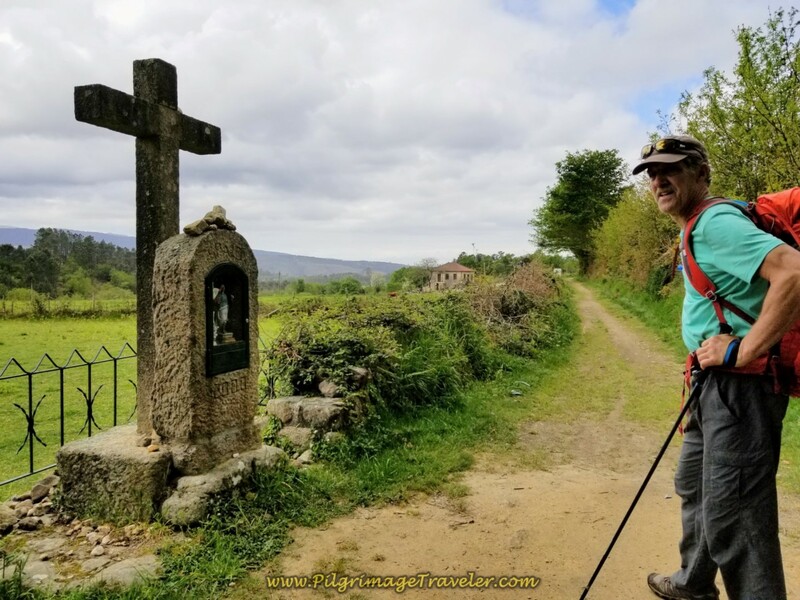 May your own day eighteen on the Central Route of the Camino Portugués be filled with delightful moments when you find your perfect stride, come to know yourself better and maybe even overcome that which brought you on the Camino in the first place. Ultreia!